30-Jul-09 :: Just leaving for Port Douglas, Queensland. I know we're repeating ourselves but the weather in Borneo is just too wet at the moment so we're resting up for a couple of weeks before heading for Guam and then Japan. 30-Jul-09 :: Check back soon for a new Trip Log entry. In the meantime, please click on any picture below to launch a gallery of pics from Borobudur and Komodo. 28-Jul-09 :: Apologies everyone, for getting so far behind on the web-site! Just a quick update to say that we are all fine and were nowhere near Jakarta for the recent terrorist attack. We were in Indonesia for nearly a month, for the final few days waiting the completion of Daniel's passport renewal. When it finally arrived on Saturday, the 25th, we hopped on a plane to Singapore immediately! So that's where we are now, enjoying time with Virginia and Ava. Thursday night we fly back to Cairns, where we have booked a rental house in nearby Port Douglas to rest and rejuvenate. Hopefully then I'll catch up on the detailed account of the trip, so check back next week. 18-Jul-09 :: Check back soon for a new Trip Log entry. In the meantime, please click on any picture below to launch a gallery of pics from Bali. 01-Jul-09 :: A connecting flight from Luang Prabang via Bangkok to Chiang Mai, plus all those health, entry and exit forms to fill in, made for a rather long day. Although we were grateful to Bangkok Airways for making the transfer in Bangkok relatively painless  they even had a special line (a short one!) for us to clear immigration before proceeding to our domestic gate. Upon arrival in Chiang Mai, we collected our baggage from the international arrivals section and found a representative from the Mandarin Oriental waiting for us. Arriving at night the resort, which is located just outside the city, appeared completely charming. And our adjoining Colonial suites were spacious and stylish as well, not to mention quite close to the main restaurant for breakfast. However, in the light of day the next morning, the buildings of the resort appeared surprisingly run down. I guess the climate is harsh and takes a toll on the exterior paint, because the resort is not that old. After a late breakfast the kids went off to the fitness center to collect their complimentary bicycles and explore the property. I spoke to the concierge about finding somewhere in town to get my hair colored, while Daniel inquired about some golf for him and the boys. At 12:30pm I headed off to the Le Nant salon in Chiang Mai, which was a 20-minute drive or so, but ended up being longer since the taxi driver had difficulty finding the place. My stylist was a lovely and meticulous Thai man who, interestingly, was wearing braces on his teeth. I believe he was the owner of the salon and as he did my color he seemed to be teaching a couple of ladies what to do. I didn't finish until nearly 3:30pm and then had to ask the taxi driver to race back to the hotel because I didn't want the boys to miss out on their golf. In the meantime, the concierge had already told Daniel that my hair appointment would not finish until 4pm so they had cancelled the golf! I felt really bad, but it turns out that the golf course was quite a distance from the resort, so the boys may have been relieved to avoid driving for up to 2 hours round-trip. Instead we decided to go into town for dinner that evening, and tried a restaurant called "The House", which had very eclectic décor and delicious food. The next morning we were collected at 9:30am by the "Flight of the Gibbon" van, and drove out into the mountains for an adventure. believe it or not, we spent the morning swinging above the rainforest on zip-lines! Our guides, Tiger, Anan and Jin, helped us to don the gear (harness and helmet) and we headed off toward the first platform. 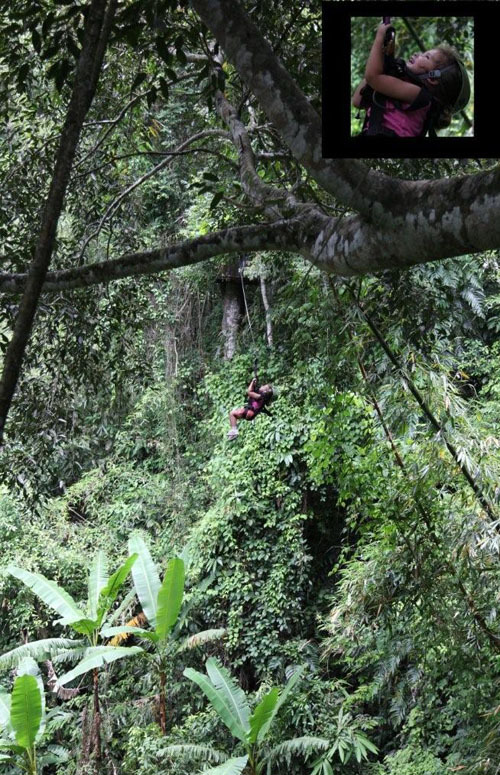 From there we crossed 11 zip-lines of varying lengths, and abseiled down 3 tree trunks of varying heights. I may have been the most nervous! But we all ended up enjoying ourselves and felt pleased at the end of the outing. Upon our return we were given complimentary T-shirts and a delicious lunch, followed by a brief visit to a nearby waterfall, before being driven back to our resort. What a great (and tiring!) day. That evening we dined at the restaurant on the property and enjoyed a bit of traditional Thai music and dance as entertainment. On our last full day in Chiang Mai, we arranged for a rental car to be delivered. We then headed off to the Carrefour, where the kids were excited to discover some familiar snacks such as Goldfish and gummy bears! Our destination was a mountain just outside of town to the north, with a famous Wat near the summit. I was surprised to find the entrance brimming with souvenir sellers and the car park completely full! Still, after climbing the 300 stairs to the top, we were rewarded with a great view of the city, and most especially the airport. From there we proceeded to another waterfall, accessed on the way down the mountain, where we spent a half an hour or so. And then we continued into town to have a look at a few art galleries, which ended up being uninspiring. That left us near the night market, so we found a place to park, stopped for "all you can eat" sushi, and then walked around the market for an hour or so. The kids were delighted to be given a budget of 250 baht (about 7 dollars) to spend on trinkets, and the sellers were not particularly pushy, so the experience was very pleasant. By 9pm we were back at the resort with a tired family. Monday morning we packed up and checked out, then hit the road going north to the Golden Triangle, and the Anantara Resort just outside of Chiang Saen. The distance was just under 300 km, and we were expecting the drive to take up to 6 hours. But the road quality was amazing and we managed the drive, with 2 stops, in about 5 hours. Daniel enjoyed being behind the wheel again, and we all enjoyed having the car to ourselves, after many journeys with a driver! Arriving at the Anantara Resort, just outside of Sap Rouk, was quite a surprise, since none of us expected it to be so big. The property is huge, in order to accommodate 26 elephants! Upon arrival I decided to go for a jog outside for a change, and ended up following the road that runs alongside the forest where the elephants are kept  how fantastic! That evening we ate at the resort's Thai restaurant, which served excellent food. It was located partially inside and partially outside, so the insects had free access. At one point I noticed a roach struggling in a bowl of sauce (fortunately a type that we didn't use! ), and our waitress showed no hesitation in scooping it out and killing it! After dinner we asked to see the list of excursions  it was extensive but costly! Although we had a vague interest in a cruise on the Mekong River, the costs (combined with our information about the water level being low) meant that our interest quickly faded. The next day the kids spent the morning working on school, and we then went into town to find somewhere to get our laundry done (again, the costs at the resort were off-putting). After that success, we headed for Mae Sai, which is a town on the border with Myanmar. Although the town itself is not particularly attractive, it is a special place because of the volume of trade happening, which involved people walking across the bridge between Thailand and Myanmar. The town (on the Thai side) is littered with electronics shops and other shops selling miscellaneous goods. Although we visited in the heat of the afternoon, when the traffic across the bridge is at its lightest, it was easy to see how much traffic must go back and forth when the temperature is a bit cooler in the morning and the evening! The kids picked up a few key chains as souvenirs. From there we returned to our resort for a quick swim, followed by massages for me and Daniel. This time was much more satisfying and we finished off the day with dinner in the resort's Italian restaurant. On Wednesday morning there was more school work on the agenda, but in the afternoon we had signed up for a class as elephant "mahouts", which are the drivers who direct the elephants. We met our guide, Seng, at 1:30pm and headed off to the elephant camp, a short drive through the resort's property. First we were taught the commands in Thai  to go forward, to turn, to stop and to go backwards. Boy did I have trouble remembering the commands! Must be getting old ... Next we were told that there are 4 different ways to get up onto the elephant, as well as 3 ways to dismount. After watching the first method of mounting, I was certain that there was no way I could do it and crossed my fingers that one of the next 3 methods might prove more suitable. ... Unfortunately, my hopes were in vain. Still, when my turn arrived I surprised myself by managing the first method! From there we all had a chance to steer our elephant through the obstacle course, turning between tree trunks. We were also given several bunches of bananas to feed the elephants, which was lots of fun! From there we proceeded (more or less single file) along the path, past the main entrance of the resort, and along the dirt road where I had been jogging the previous evening. The elephants took us down the embankment to the river, where we stayed upon their backs as they entered the river for a bath! Some of the elephants were more playful than others, and enjoyed spraying water from their trunks over themselves and anyone in the way. The rest of the time we splashed the elephants to cool them off and clean them, which they seemed to enjoy immensely. Once all the elephants were clean, they came out of the river. Up on the river bank, the elephants dried much faster than we did (since we were all completely soaked!). The last step was to take our respective elephants to their place in the forest for the evening. By the time we all returned to the road near the forest, it was just after 3:30pm  our elephant adventure had taken just over 2 hours!! At this point we were all in need of a nice, refreshing swim. The pool and hot tub were very relaxing, and kept us entertained until dinnertime, when we felt too lazy to venture out of the resort and returned to the Thai restaurant on site for another delicious meal. On our final day in the Anantara Resort, we relaxed for the morning and drove into Chiang Rai in the afternoon. It was not a very ambitious outing, since all we did was visit a Tesco supermarket in search of more grapes and Ritz crackers! But the drive was very pretty and we saw more of the Thai countryside. The general consensus was that we are all in need of some down time  fortunately only a few days until we fly to Bali for 2 weeks of relaxing in villas. That evening we mustered up the energy to eat in the Italian restaurant again, where Daniel and I treated ourselves to steak for dinner  perfectly cooked and a lovely piece of meat! After a late breakfast (we seem to be getting up later and later!) we packed up and headed to Chiang Rai airport, where our flight to Bangkok departed on time. We arrived at about 6pm and waited quite a long time for our luggage to be unloaded. Then we had an hour's drive to the Four Seasons, after which I was exhausted, but the kids were preoccupied with the fact that Transformers was showing and wanted to head straight out to the cinema. So once all our luggage was delivered to the rooms, off they went with Daniel, while Francesca and I stayed behind to relax. I watched Bride Wars on pay-per-view, knowing that Daniel wouldn't be interested, then tuned into some tennis at Wimbledon (the time difference is very convenient, since all the matches are aired at night here  ideal for watching TV in bed). Daniel and the kids didn't get back from the movie until 11:30pm, and I barely managed to wait up for them! Saturday morning we had room service for breakfast, then headed out to the nearby shopping mall. The main plan was to see Night at the Museum 2, then look around in the shops. There was a great book store, but we didn't find anything enticing. The boys' backpacks have been falling apart and they have always been too big and heavy, so it was a relief to replace them with something more suitable. After the movie, we also treated ourselves to some sushi, followed by Haagen Daas ice cream, since we hadn't seen it for a long time. Then it was back to the hotel to get to bed for another early morning wake up, since our flight was leaving Bangkok at 8:40am for Bali. Click on any picture below to launch a gallery of pics from Thailand. 26-Jun-09 :: I thought there was a lot of paperwork to fill in to enter Vietnam  well, Cambodia takes over as number one. This time I filled in a health declaration for each family member, a customs form for each family member, a visa application form for each family member and an entry/exit form for each family member. The flight from Ho Chi Minh City was only about 40 minutes and, in spite of writing the entire time, I was not able to finish filling in all the forms! Having said that, the whole process upon arrival could not have been easier or quicker, really, and the people are very friendly and easy-going. Since we didn't have passport-sized photos of everyone, we had to pay a "fine" in order to process our visa applications, which took about 20 minutes at most. Anyway, by the time we exited the airport and reached Raffles Hotel in the center of the city, it was completely dark and about 8pm. The hotel staff were extremely pleasant, and offered us an upgrade to a suite adjoining to a regular room, which constituted a very nice upgrade. Again, the benefits of travelling during the low season! We would be relieved to have an extra bed in the room at no extra charge, so this was a really generous offer. After ordering some room service for those who were hungry, we got everyone into bed as quickly as possible. In the morning we headed down to the restaurant for breakfast, which was a shocking $80 for all of us! That got me thinking about looking for a supermarket ... Later in the morning we arranged a driver through the hotel, who took us to S-21, the former high school building which served as a prison and torture center during the rule of the Khmer Rouge. We gave it a lot of thought before deciding to bring the kids along, but it worked out well. The museum is spread between 4 buildings, and the kids were able to just visit the rooms they wanted to and stop after they felt they'd taken in enough. There were photos of the Killing Fields, which basically are covered in skulls and random bones of the victims of the 3 year, 8 month and 10-day official rule of the Khmer Rouge  the numbers are put at anywhere from 1.5 to 3 million deaths, which is up to 50% of the total population at the time. The whole idea is nearly impossible to comprehend, and yet it happened. Particularly after visiting Vietnam, and seeing how well Communism has worked out for them, in spite of how hard they had to fight for it  to see similar intentions gone so wrong so nearby is mind-boggling. In fact, many of the Khmer Rouge leaders shared similar backgrounds to Ho Chi Minh! At any rate, the experience of visiting the museum was very enlightening overall. Our driver then took us to a supermarket, where we managed to find plenty of American breakfast cereal, familiar crackers and cookies, plus fresh milk (unfortunately no goldfish crackers though!). He then took us to a book store, but Daniel was unable to find his favorite magazine, The Economist. By the time we returned to the hotel it was late afternoon, so I visited the spa for a much-needed leg wax, and Daniel paid a visit to the sauna. We then decided to get room service for the kids again and dine in the posh restaurant downstairs. We were both pretty keen for a juicy steak, and we were not disappointed. The restaurant was absolutely lovely, with impeccable service  very colonial! Next morning we had just enough time for Daniel and Benjamin to walk over to the Imperial Palace for some photos before we needed to head back to the airport. Another short flight on a small plane  think I've had enough of those. But since the alternative was to drive for 5 hours in a 1995 van, I guess the 40-minute flight wasn't so bad. And since it was a domestic flight, at least there were no immigration forms for me to fill in! As we drove from the airport into Siem Reap, we passed hotel after hotel  although we'd done a lot of research before choosing a hotel and had an idea that the city contained a plethora of hotels, we were still quite stunned. The city is home to over a million people, but still maintained a rather small-town feel (certainly in comparison to Indian cities of similar size!). Upon arrival at Hotel De La Paix, we were very pleased with our choice  the location was very central and the building itself was quite stylish. Our interconnecting rooms were lovely and couldn't have been a better value for money either, at $160 per room, per night, including breakfast! That afternoon we managed to visit the swimming pool on the 1st floor, which was beautiful, with islands of greenery dotted around it. The girls made a new friend from Beijing as well! Later, the boys and I left the hotel and walked briefly along the river, trying to get a feel for the city. That evening we dined in the hotel restaurant, where we found that the dinner menu was perhaps the only downside to the place. Fortunately, the next morning we discovered that breakfast was much better! After discussing what outings we'd like to do there, I approached the concierge for some advice. He was sure he could arrange a car with a driver and an English-speaking guide within a half an hour, and suggested that we first visit the Tonle Sap (largest lake in Southeast Asia) for a boat ride through the floating village, then continue the day with visits to two of the famous temples nearby. We met Sal, our guide, down in the lobby about 45 minutes later, and headed off for the lake. The drive to the lake follows the river that leads into the lake, so we saw many examples of houses on stilts along the way, ranging from modern palaces to very simple stick structures. The houses on the lake literally float, and they move around the lake based on the season  in the dry season, when the lake is quite small, they live virtually in the center, but as the rainy season sets in the lake grows to more than twice the size and the houses are forced to move closer to the shore for protection. It was fascinating to see a floating school, floating restaurants, and even a basketball court! We stopped at a floating fish farm and crocodile ranch, where they also kept a python. I think the boys both had a turn holding it. After the cruise, we stopped back at the hotel for fresh camera batteries and some cash, then headed out again to pick up some snacks at the supermarket and to visit a couple of temples in the complex. First of all we went to Ta Prom, which is famous for having appeared in the movie Lara Croft: Tomb Raider  the place is in a fairly ruinous state and has many banyan trees growing within the temple complex and strangling fig trees growing out from the roof. Sal told us that in the busy tourist season (December and January) people line up for 30 minutes to get a photo of the best trees amid the ruins! Fortunately, the crowds were mild and we managed to get plenty of photos while on the move. Everyone was impressed by the shear magnitude of the temple  as we walked through it seemed to go on forever! Although much of the site is in ruins, we were still able to see many beautiful examples of the carving typical of the area. Our second stop was at Bayon, located in the main city of Angkor Thom, and known for the multitude of Buddha faces that are carved onto all sides of the towers. The heads make excellent photographic subjects, so everyone was happy there. With the heat and humidity, we then called it a day and returned to the cool, refreshing pool at the hotel again. That evening we decided to head out for dinner, having read the tripadvisor recommendations for the area. With a bit of difficulty, the concierge was able to direct us to the New Delhi restaurant, which ranked 2nd on the tripadvisor list. Fortunately it was a short walk from the hotel and the food was amazing  the restaurant was not impressive, and without recommendations we would never have chosen it, but the pakoras and chicken samosas were incredibly fresh and delicious. The kids also enjoyed the spinach curry with potatoes and the butter chicken. The next morning we agreed to get up to visit Angkor Wat at sunrise. We met Sal in the lobby at 5am and headed off  the roads were surprisingly busy and the entrance to the temple complex was positively buzzing! Still, once we arrived and began walking across the bridge that spans the moat, the feeling of crowds ended. Everyone gathers in front of the east pond to watch the sunrise  then all the visitors move to the west pond after the light gets a bit higher. But once we left the ponds, the place didn't feel crowded at all. The carvings throughout the wat were lovely, and we enjoyed strolling around and taking pictures. From there we returned to the hotel for some breakfast at about 7:30am, and headed out again at 8:30 to see a few more. The temples are totally amazing! The kids seemed to genuinely enjoy looking around and showed real appreciation for the skill involved in making the carvings. In spite of being tired due to rising early, we were inspired to head out to dinner again, given our success from the previous evening. This time we looked for the infamous "Pub Street", the nickname given to the street in Siem Reap with the highest density of restaurants and bars, to Le Tigre de Papier, another tripadvisor recommendation. Once again, we were not disappointed. The local dish of Amok did not disappoint, nor did the pizza. And they also serve a delicious margarita! The walk back to the hotel was pleasant, but the kids were concerned about the people we saw begging since they had limbs missing and were clearly victims of land mines. They took great pleasure in giving them each a dollar, but we talked about ways to give such that they could benefit more, and ended up leaving Cambodia with quite a bit of information, including web-sites for groups involved in poverty reduction. The next morning we had a leisurely breakfast and were ready to go at 7:30am, headed out of town to the Kbal Spean waterfall. We reached our destination before 9am and started the 1 hour walk up to the waterfall, which was really pleasant. Although it was an uphill walk, it never felt too taxing and we enjoyed the exercise. Since it was a Sunday, we seemed to be joined by the majority of the local teenage population, who were heading up for a weekend picnic. After about a half an hour walking along the river and photographing the linga (carvings on the rocks under the water), we turned around and headed back down to the car park. From there we stopped off at one of the more beautiful temples, the Bantay Srea, which is also known as the lady's temples because of its great beauty. Although it was very small, the carvings were incredibly detailed and one only had to walk a few feet to find another photo opportunity! From there, we proceeded to the Land Mine Museum, where we were able to read about the lives of some of the children who are now supported by the organization. All the biographies were completely sad in different ways ... The man who is responsible for the museum is some kind of saint, and I'm pleased to see that he's a Cambodian helping his own countrymen, which makes me want to help out. As a start, we bought numerous T-shirts! That evening we again headed off to "Pub Street", where we dined at Kamasutra, another Indian restaurant. The décor of the restaurant was very eclectic  it was like a loft with exposed brick walls  and the food was delicious (though not quite as cheap as the New Delhi) and we enjoyed our meal again. All in all, the choice of restaurants at a reasonable price was nearly as exciting as viewing the amazing temples! Both experiences were extremely rare in Southeast Asia. I was also relieved to see that the Cambodians value wine, which meant that the prices were quite reasonable and the selection was impressive. Our visit to Siem Reap really exceeded our expectations, and we felt we could have easily spent more time in the area. With a bit more information, we probably could have happily planned to spend more time in Cambodia in general  the people were so lovely and easy going. We were all hoping to repeat the experience in Laos, and were not disappointed. The flight was uneventful (though again, I had just enough time to fill in most of the paperwork), but applying for the visa and waiting to clear immigration was very time-consuming. Daniel made the unpleasant discovery that his passport had no more full pages free, which could prove problematic. Finally we collected our bags and exited to find a representative of our hotel waiting. After checking into our rooms, which were lovely bungalows with beautiful balconies, and located near each other, we proceeded to afternoon tea in the restaurant. We browsed through the hotel's menu of activities, which included a trip to a nearby waterfall, a cruise to a famous cave, and a sunset cruise. However, the prices were stunningly high  our family would be unable to participate in any outing for less than $300! So after enjoying a complimentary dinner in the hotel, followed by breakfast the next morning (which was OK) our priority was to head into town and find a tour operator to offer us a trip to the waterfall at a better price. Surprise, surprise, we were offered an air-conditioned van with driver for 4 hours for $40! Before heading back to the hotel, we walked on to the book shop, called Big Brother Mouse, and purchased about 20 books to take with us on the drive to the village the next day, and donated some extra money for the staff to buy additional books and distribute them as needed. Then we returned to the hotel for a swim and a mediocre dinner. The next morning our driver picked us up from the hotel and drove us along the road to the waterfall, stopping off at a Hmong Village along the way. Daniel had the books we had bought the previous day and was ready to distribute them among the village children  at least he thought he was, but nobody could prepare for the way the kids cornered him when they realized what he had! They were jumping and climbing on him in an attempt to get at the bag full of books, as he struggled to give books to as many children as possible. It was quite a sight! The books were all distributed before we really entered the village, in the end. From there, we proceeded along the walkway and were bombarded by children carrying bracelets and bags and chanting, "OK, you pay 5000 (meaning kip, the local currency)", over and over again. Someone must have taught them to sing it as a song, which was charming in the beginning but began to wear thin quite quickly ... So we purchased an embroidered pillow cover and a few bracelets, which Miranda ended up forgetting and leaving in the van later. But as we walked along we were pleased to see children sitting and reading the books we had brought! Meanwhile, we arrived at the Kuang Si Waterfall, where the car park was full of booths selling all sorts of food and crafts. First we proceeded down the rainforest path toward the bear sanctuary. It was really quite sad to see the bears they've rescued from poachers  it's completely horrible to think of the torture those bears tolerate in order to fuel the Chinese herbal medicine trade, as well as the odd restaurant serving bear paw soup. We were all horrified, but they seem to be doing well in the rehabilitation centre so we made a donation. From there we reached the river and gradually hiked up the moss-covered path to the big waterfall at the top. We happened to overhear a couple of ladies walking behind us saying that they had cycled to the waterfall (the drive had taken us nearly an hour)  turns out they were on a cycling trip and had come from Chiang Mai! We were all in awe of their achievement. The boys took quite a lot of time to photograph the waterfall just so, but got lots of pleasure from the experience. Just as the rain began to fall, we headed back down to the car park. From there we returned to the hotel by 1pm. Later that evening we returned to town for dinner at L'Elephant restaurant, which was a lovely spot. From there we walked up to the main road and stopped into a few shops. One, in particular, caught our attention, with gorgeous carvings in ebony and rosewood. Someone had really taken the time to sort "the wheat from the chaffe" as I like to say, and found some amazing pieces (priced at a premium, obviously). With all the kids in tow we decided we'd be better off returning in the morning for a serious look, so we then proceeded to the night market. Although there were lots of cute objects for sale, the local ATM was not working and I think the sellers missed out on a lot of sales as a result. We made it back to the post office (our hotel shuttle's designated meeting point) with moments to spare, and were snuggled into our beds soon after. Next morning we had breakfast and took just Miranda into town with us. As quickly as possible (but still trying to be sensible) we chose some amazing pieces from the shop with all the rosewood and ebony, and then proceeded to another textile shop for some wall hangings. Fingers crossed that they look as amazing in Vermont as they did in Luang Prabang! Soon after, we had checked out of the hotel and were heading for the airport. The flight was uneventful and the paperwork was slightly less than the previous countries! And Daniel was relieved to discover (via the managers of the villa we have reserved in Bali) that he will be able to pay a "fine" in order to enter Indonesia, even though he no longer has a blank page in his passport. Since we plan to be in Indonesia for at least 3 weeks, this gives him a bit more time to renew his passport. Click on any picture below to launch a gallery of pics from Cambodia. Or click on any picture below to launch a gallery of pics from Laos. 22-Jun-09 :: Le Residence hotel in Hue was in a lovely location, with views of the riverbank and a gorgeous swimming pool. After several hectic days, we were all feeling rather tired and a few of us were still not 100% health-wise after the virus that went through the family. On Tuesday morning we enjoyed our breakfast and then returned to the room, intending to head out and explore the city shortly. With the heat, it seemed logical that we would wait until late afternoon, when the temperature dropped and shade was plentiful, to venture out. Somehow the day just passed us by while the kids did some school work and Daniel and I looked at furniture for the house in Vermont on the internet. Suddenly it was 5pm and we were informed that the citadel was closed! With only 1 day in Hue, we were feeling rather like losers for having wasted it. But since Wednesday's itinerary was simply to drive from Hue to Hoi An (about 2 1/2 hours), we decided there was enough time to get out in the morning, before the heat became intolerable, and see what we'd missed. So Daniel arranged for a guide and some bicycle rickshaws to take us across the river and around the citadel. The outing was very pleasant and educational, as we learned a bit about the Vietnamese royalty who ruled from Hue (in conjunction with the French colonists) from approximately 1800 - 1950. The kids found lots of interesting buildings to photograph within the ancient city. We then returned to Le Residence in our rickshaws, finished packing up, and started the drive down to Hoi An. We received a very pleasant surprise upon arrival at the Nam Hai, located just outside of Hoi An. What a fantastic place! We also discovered one of the main perks of travelling in the low season, as we were offered a massive upgrade from the villa we had booked  instead of a 2 bedroom villa, we were offered a 3-bedroom with a private pool and a gorgeous view of the beach! One of the manager's later cryptically mentioned that our villa belongs to "someone important". I have to say that we thoroughly enjoyed the place and made maximum use of the facilities in the villa. There were free movies on demand (not all recent, but a pretty good selection) and the kids watched a different one each night. After being on the move so much for 2 weeks, we all enjoyed just staying put and doing very little for 5 days. Breakfast was delivered to the villa each morning and served by our 2 "butlers"; generally we would then go for a swim. Benjamin and Felix dove into their school work, taking advantage of the complimentary internet access. Miranda spent most of her time befriending the butlers, and Francesca rediscovered The Lion King in the selection of movies-on-demand, which she watched a number of times. We did manage to get into the village of Hoi An, which has successfully maintained its traditional character, with gorgeous buildings full of shops and restaurants. Daniel found some art to buy and we got the kids some ice cream, but the weather was amazingly hot and we were literally melting. For the remainder of the stay we dined at the Nam Hai restaurant and enjoyed their selection of Indian and Vietnamese cuisine, plus the lovely surroundings. It really was quite ideal, and everyone felt rested by the time we departed. The highlights of our stay in Hoi An  the girls found a snake in their room one morning! Most mornings I had to drag them out of their room to have breakfast (while they were glued to the TV!) but on this particular morning we heard them long before normal and there was a high level of excitement. That's when we learned that a snake had been spotted behind a door and that an expert had been called to remove it. The excitement was over before we knew it, and things went back to our normal quiet relaxation. We did venture down to the beach one day, but the sand was nowhere near as nice as it had been in the Philippines, so we avoided it after that and stuck with our private swimming pool. Each evening our butlers served us a glass of wine and some canapés before we went off to dinner, where there was live entertainment  a very talented and glamorous singer! Miranda befriended her on our first visit to the restaurant, and after that spent most of her time (other than eating her dinner) sitting beside the singer at the piano. Miranda also took advantage of the activities at the Nam Hai more than anyone else  she had a lesson on how to give a massage, and watched a cooking demonstration (which enabled her to return to the villa with the most delicious spring rolls!). However, Daniel and I managed to venture out for our complimentary massages  2 for each of us! Professional massage is one discovery that Daniel has made on this trip  prior to India, it would have been nearly impossible to convince him to have a massage, but now he is the one making the suggestion and we have had several massages together! By the time we left Vietnam, it was safe to say that we all agreed on the cruise in Halong Bay as the highlight. But Daniel and I also enjoyed both of the major cities a lot  quite a change from India, where the cities were probably our least favorite places. Overall, since we arrived in Vietnam with quite high expectations, I'd have to say that we enjoyed our stay but were marginally disappointed. One area where we couldn't complain would be the weather  having accepted that our visit would fall during the rainy season, we really didn't experience much rainy weather. Our visit to Sapa was very rainy, but that's one area where rain isn't limited to any one season so that experience could be repeated any time of year. The rest of our visit was remarkable for the amount of sun and the heat! We found ourselves rather surprised by the degree of development in Vietnam, and the people could only be described as quite serious and industrious. I would say that they possess a high degree of pride and are determined to improve their country with little aid from outsiders. All of this is very admirable. Travelling around the country was a bit more draining that I'd anticipated, though. Part of the challenge was the language barrier  Vietnamese is just not the sort of language that one picks up by using a phrase book for a couple of weeks, and we didn't encounter very many good English speakers. That is, the people who do speak English struggle with the pronunciation and are quite difficult to understand. Our departure from Da Nang airport was very low key  we didn't even manage to spend the remaining Vietnamese Dong we were carrying  and our layover in Ho Chi Minh City airport went by very quickly. Before we knew it we were landing in Phnom Penh, excited about experiencing a new country! Click on any picture below to launch a gallery of pics from Hue and Hoi An. 17-Jun-09: Enjoying the peace and calm of Lunag Prabeng, Laos before leaving for Northern Thailand. 16-Jun-09: Just returned from a visit with the children to a Genocide Museum in Phnom Penh. Our arrival in Hanoi was also pretty smooth (as long as we skirted the puddle of vomit on the way to the arrivals hall! ), and we made it to our hotel in less than an hour. The Sofitel Metropole is an old colonial building in a central location, and absolutely lovely. On the drive into the city I noticed that there are not nearly so many motor bikes in Hanoi as in Ho Chi Minh City. At first I thought it might just be due to the fact that it was Sunday, but the rest of the week I made the same observation. Of course, considerably fewer people live in Hanoi, so that may be part of the reason. That afternoon we got some lunch in the hotel and then headed off to the Museum of the History of Vietnam. We felt very aware of our limited time in the city and wanted to make the most of it! The museum was housed in a very pretty building and covered everything from pre-history to the last century. We had been hoping for more recent history, but enjoyed our experience nonetheless, particularly as the museum was only a short walk from the hotel. That evening we dined in the posh restaurant of the hotel, known as "Angelina"  an Italian restaurant that also specialized in steak. Daniel and I were both keen for a steak and although he was not impressed with his New York Strip, my fillet was delicious! That evening, though, Daniel started to feel under the weather and by the next morning he appeared to have truly caught Felix's cold. So Monday we decided to take things easy. In the morning we went off to breakfast and brought back a thermos of orange juice and a couple of croissants for Daniel, after which the kids tackled some school work. By noon we were all feeling a bit hungry, so I used the internet to locate a nearby supermarket, hoping that housing the nation's capital might mean that the shop would carry some international goods. Although the kids moaned a bit, we set off walking to the supermarket and ended up really enjoying the outing. It was necessary for us to go around a small, nearby lake in order to reach the Intimex  when we arrived we were pleasantly surprised to discover goldfish, oreos, ritz crackers and seedless grapes! So everyone was happy after that and we returned to the hotel in time for afternoon tea. The kids were more interested in diving into their snacks, but Daniel seemed to be feeling better so he and I tried the afternoon tea. The scones were OK, but the rest of the sandwiches and mini pastries were delicious! After that everyone was ready for a swim and we all headed to the pool. Unfortunately the heater had gone haywire or something, since the water temperature must have been 95 degrees! Needless to say, it was not refreshing. Still, we managed to soak in it for about 20 minutes before going off to get ready for dinner. Another lovely meal in the Spices restaurant, serving Vietnamese food, had us heading off to bed early. Tuesday morning we managed to arrange a late check-out from one of the two rooms, since our train was departing at 10pm. So after consolidating our belongings into 1 room, we hopped into a taxi to visit the Ho Chi Minh Museum and surrounding area. There was plenty of recent history on display here, including a fairly complete biography of the man himself  I was surprised by how much I learned, not the least of which was that Ho Chi Minh was a veritable Gandhi for this region. That area of the city is also home to the one-pillared pagoda (nothing too special) and the house where Ho Chi Minh lived while he was president  it is located on the grounds of the grand villa which had been home to the French Colonial Governors, but is intentionally much more modest. We returned to the hotel to dine at Angelina's again, but found the service rather disappointing in comparison to our meal 2 nights earlier. But we were relieved to be heading off to the train station with everyone well-fed, since there is no dining car on a Tuesday night! The overnight train to Sapa has to be one of the highlights of the trip so far. The kids absolutely loved their little cabin with 4 bunks, and behaved really well. In spite of the "luxury" train cabin, the cars are just attached to the end of the normal train, so we still experienced the train station as we would have. The layout is rather unusual compared with what we experienced in India  there was no central entrance or numbered platforms with schedules flashing  in fact it all seemed rather haphazard, and I wasn't convinced we'd been shown to the correct train until the Victoria resort representative met us! Once we got all our luggage on board and stowed beneath the berths, the kids put on some DVDs to watch and Daniel and I also watched an action movie on the laptop while drinking a reasonably-priced bottle of wine from the supermarket. What a lovely evening! Then we went to sleep with the rhythmic sound of the wheels running on the tracks in the background. We awoke to the same sound, as the train approached our destination at 6am. There we were met by a van to take us up to the town and get checked into the resort. Fortunately our room was ready upon arrival, which was really nice. Although it was raining, the mountains looked quite picturesque with all the clouds and fog floating through, and we had a lovely view from our room. That morning I had started to come down with a cold and by the afternoon both Miranda and I could barely breathe. Since the weather continued to be rainy, it made sense for us to just stay in the room and rest as much as possible, and soon Ben joined us in going through tissues by the box. What a group! That evening Daniel conceded that room service was the best bet for dinner, and we all made it to bed early. The following morning I was not feeling much better and, although we were all keen to see more of the local area, the rain continued to fall. I managed to find the energy to get the boys to do a bit of school work, at least, and by the evening we all felt sufficiently well to wander down to a nearby French/Vietnamese restaurant, the Gecko. Ben was keen to try the margherita pizza  unfortunately, when it arrived it could only be described as barely edible. Having said that, the spring rolls were definitely the best we've had anywhere, so it was an interesting meal! Finally, on our last day in Sapa, we decided to venture out and see the Silver Waterfall. The weather had not improved  in fact, the temperature had dropped quite dramatically  and the visibility was very low, but we drove to the spot and the boys climbed up the steps to see it close up. After that we returned to the hotel to wait for our van to the train station, and the return over-night journey to Hanoi. Once again, the train was a delight  it departed on time at 9pm and we were surprised to learn that the arrival time was 5:15am, since we were expecting to be collected from the train station at 6:30am! Daniel and I made the mistake of staying up rather late watching The Deer Hunter, which had me in tears again. So when the conductor knocked on our door at 5am with some tea, it felt very early. Knowing that we had an hour to wait, we wheeled our suitcases to the ticket area and made ourselves comfortable. Unfortunately, we attracted some unwanted attention from other travelers, who felt the need to sit a couple of feet away and stare at the kids. Obviously, after the short night of sleep we were not at our most tolerant ... Once all the early morning trains had arrived, we were in for a slight shock because the staff started asking everyone to leave the building! So once again we moved all our luggage outside to the front of the station to watch for our van. 6:30 came and went, and still no van. Fortunately, after all the rain the temperature was quite pleasant, so waiting outside was tolerable. Still, when 7am had arrived and our van had not, we began to lose our sense of humor. The plan for the day was to drive for 3 1/2 hours to Halong Bay and catch a boat for a 2-night cruise, so we began to wonder if it would be necessary to make alternative arrangements to get there. Finally, at 7:30am the van arrived  we piled in and collapsed in our seats, ready to catch up on some sleep! Although, along the way I happened to notice the consistency in the style of high-end buildings, which is very tall and narrow but quite attractive with a very detailed exterior. We had noticed the same thing throughout the country. By the time we reached Halong Bay, the weather had improved dramatically  the sun was shining brightly and the temperature had risen quite a bit. We were quite happy to see the sun after 3 days of rain in Sapa, and the heat is always more tolerable on the water. We were taken to our boat, "Valentine", where we had taken up 3 of the 5 cabins on board. Our first night on board, we shared the experience with Beth and Eliza, a mother and daughter originally from Connecticut, and their Vietnamese tour guide. We first motored to a rather busy spot where Daniel, Benjamin and Felix climbed up to the top of a peak for the view, while the Miranda, Francesca and I played on the beach, attracting a bit too much attention. Felix showed me a panorama he took from up on top of the peak, and it was gorgeous! From there we moved on to a more secluded spot to kayak through a couple of caves which are home to bats. We so much enjoyed being back on the water and paddling around in the kayaks! After that we returned to the boat, where Benjamin and Felix were keen to have a swim and jump from the top of the boat into the water as many times as possible  they even got Miranda to join them. I am amazed by how much pleasure they get from this simple activity! Another multi-course meal for dinner, and we were all in bed by 9pm after our long night and early morning. Of course, the next day we were up early and ready for action! I was still feeling less than 100%, and Miranda's cough was still pretty bad, but we were so excited to be spending the day on the water. The "day boat" (a slightly smaller boat where we spent the hours of 9am Ð 4pm, mixing with guests from Indochina Sails other 3 boats) picked us up and we raced aboard, ready for the day. Unfortunately, I soon realized that I'd forgotten to bring any toys for Francesca, so I was a bit uneasy about how she would behave once the inevitable tiredness settled in. At first the boat motored out among the rock formations in the bay for about an hour, until we reached our destination. Then we all paired up in kayaks and paddled to a nearby cave, where Benjamin and Felix accompanied the rest of the group and walked inside for about a half an hour  only to return directly to the day boat in the kayaks afterward. I was a bit disappointed, as ducking into the cave was not appealing to me so I waited outside for everyone and was then further disappointed to learn that no more kayaking was on the agenda at the time. Oh well. Back on the day boat, we motored on to another spot near a couple of beaches. From there we spent a couple of hours swimming, kayaking and (for the kids) jumping off various parts of the boat. Daniel and I swam almost as far as the beach before the sharp rocks below began scraping us and we turned around and returned to the boat. Once everyone was back on board it was time for another absolutely huge meal! Although the food was fantastic, I'd have to say the one criticism of the trip was the quantity  there was just too much. By the time lunch was finished, the day boat began heading back to the rendezvous point with "Valentine", another lovely ride. We had the privilege of spending the day with lots of lovely people  particularly 2 Australian couples who were very friendly with the kids (we had all been together at the hotel in Sapa as well, but didn't get to spend any time together). The staff on the day boat were also lovely, keeping Miranda busy with games of dominoes and cards, and entertaining Francesca too. Upon our return to "Valentine", we were happy to see Tony, the manager, again. All Felix wanted to know is whether they would have time to do some more swimming and jumping off the top of the boat! So we did a quick tour through the floating fishing village, which was really fascinating, then anchored at our overnight spot, which enabled the kids to have their wish. Once they were cleaned up it was again time for a huge, multi-course dinner and then an attempt at squid fishing. Everyone slept well again that night, after a long day outdoors in the heat, and in the morning Tony surprised the kids with another opportunity to have a swim and jump off the top of the boat repeatedly! Knowing that we had a long day of sitting in the car and on a plane, I was glad for them to have this chance to be active, even if it was still before breakfast. Once we completed our breakfast, the "Valentine" starting heading back to shore, where we disembarked at around 11am. Although our driver was ready, we decided to kill some time at the Indochina Sails café before leaving for Hanoi airport. Even so, we arrived about 2 1/2 hours before our flight's departure! Fortunately the drive was not too painful, and we all managed a short nap along the way. And the extra time at the airport came in handy for booking some flights that were giving Daniel trouble on-line. Everyone managed to have something to eat as well before boarding the flight for a short flight to Hue, which arrived on time. We were all happy to get settled into our hotel rooms upon arrival and head off to bed. After subsisting on puri, paratha and green grapes in India (with the occasional addition of bacon at breakfast), Francesca has had to make a few adjustments to her diet in the Far East. We have been able to find seedless red grapes in the supermarket here in Vietnam (as we did in Hong Kong, Shanghai and the Philippines), and fortunately she has not protested at the color change. She is enjoying steamed rice, but not so keen on the fried rice, and she will occasionally agree to eat pineapple when grapes are not available. Since the food here is not so spicy, we can sometimes convince her to eat the chicken, so she's finally getting some protein. Ben and Miranda have rediscovered broccoli and carrots, which they enjoy stir fried, and they have also taken a liking to mango, which is at its best this time of year. Felix likes to stick with his favorites  cauliflower, bananas and apples, which we come across most of the time. But overall I must commend the kids on their flexibility when it comes to meals  they have been fairly adventurous in trying new things and adjusting their expectations (since sometimes they order a familiar food from the menu and when it arrives the resemblance is not very good!). Click on any picture below to launch a gallery of pics from from Hanoi, Sapa and Halong Bay. 02-Jun-09 :: As the plane flew over the South China Sea from Manila to Ho Chi Minh City, I was busily filling in forms. There were the usual arrival cards, asking for passport numbers, reason for visiting, place to stay, etc., plus the new "health declaration" forms, asking about flu-like symptoms. Filling out 6 sets of forms seemed to take me most of the flight time! We had applied for visa on-line, but knew that we had to collect them upon arrival. So once we deplaned, signs pointed us to the desk for collecting visas. Although the website had stated that 2 photos of each person were required, we were fortunately only asked to produce 1 photos of each applicant (we were short a photo for each of the boys!). Then they asked for payment, which they wanted in US dollars, cash. Oops  we only had $80 or so, and the total was $150! The one gentleman behind the desk who spoke English was trying to say something to me, but it took several attempts before I realized he was asking if we had any Euros  then I remembered that we had about 50 pounds, gifts from Simon and Debbie for Felix and Miranda's birthdays! So luckily they accepted the pounds and dollars in combination as payment and we were then ushered to the immigration desk. A representative from the Park Hyatt Saigon met us as we exited the airport, and loaded our bags into a big van for the 35-minute journey. It may sound strange, but one of the first things we noticed was the excessive number of cables and wires hanging between poles  there are literally hundreds of them, hanging both along and across the roads. I guess digging trenches to put them underground is too much trouble, but they are a bit of an eyesore. However, we were very excited to have used our Hyatt points in order to book the three nights there at no cost. The hotel is a lovely building in a very central location, and the rooms are very stylish, with the character of old French colonialism. After we got settled into our suite, I snuck down to the gymnasium for a quick workout while Daniel took the kids for a swim, before heading down to the Italian restaurant in the lobby for dinner. Although we probably should have eaten Vietnamese food on our first night in the country, there was a special risotto promotion going on, so most of us tried one of the many risotto options on the menu. My lobster risotto was OK, but could have been better. The breakfast in the same restaurant the next morning was much better  delicious waffles and pancakes, plus a buffet with strawberries and cereal! That day we dragged the kids out for a walk in the center of Saigon. I did not have high expectations of the city, based on what I'd read previously, but we were all pleasantly surprised. Although the pavements are uneven and there were some suspicious smells floating about, the area was also full of stylish shops and cafes, plus a number of beautiful buildings. We passed the Notre Dame Cathedral, and made the required visit to the post office, which is housed in an absolutely stunning building. Another surprise was the discovery that a package could also be sent for a rather reasonable price! From there we continued on to the Independence Palace, only to discover that it doesn't open until 1pm. With just under an hour to kill, we decided to visit the Ben Thanh market, which had been recommended by my friend's sister, Jan, who lives locally. The market was very interesting  we managed to buy some very expensive seedless red grapes, then wander around to where they were cleaning up the remains of the seafood market. After passing enough time, we returned to the Independence Palace and had a pleasant walk around. The building is still used in an official capacity, just as it was by the French Governor a century ago, but in the basement is a room of photos dedicated to independence, showing the tanks rolling in on the 30th of April, 1975. We returned to the hotel for a swim in the afternoon, then Jan came to meet us for dinner. A day out in the humidity had exhausted us all, so we only had enough energy to venture out to a very nearby restaurant called Mandarine, which is on the hotel's list of recommended restaurants. The atmosphere was lovely and the staff were great to the kids, even performing magic tricks! Felix discovered a new type of spring roll that he really likes, and we tried a lobster dish as well as a lot of rice, and the kids finished with some ice cream. Overall the food was OK, but we felt the cost was very high. Jan told us about her experiences in the past year living in Ho Chi Minh City, which were all very interesting, since she works at the Singapore International School. Apparently the demand for schools of this nature is really growing and she and her husband are working hard to help open more schools in other areas of the country. The next morning we had scheduled a tour out of the city to the Coo Chi Tunnels, which are famous because this entire village lived underground, in these tunnels, for several years while fighting against the Americans. I was amazed to discover that the soldiers faced resistance so close to Saigon which, being in the south, I had assumed was in support of the American assistance to fight the north. It took us about an hour to get out of the city, and another 30 minutes of driving in the countryside before we reached the tunnels. The area is very well maintained and the system for showing visitors around is quite well organized. Our guide was called Tan and he explained how the villagers camouflaged the entrances to the elaborate system of tunnels, and then the kids were given an opportunity to slide into one of the small entrances  basically just a rectangular hole in the ground (but very tiny!). After that we were shown various "traps" that were set to capture enemies, most of which involved very sharp bamboo spikes. Finally, we had a chance to walk through one of the dark tunnels. Apparently they have been widened and reinforced for the benefit of visitors, so one has to imagine the smaller size and risk of collapse, on top of the darkness. Tan took the kids through one tunnel and then they asked to go through another  I think they could have done that all day! We made the 1 1/2 hour drive back to the hotel and the kids got settled in the room do some studying, while Daniel and I headed out to the War Remnants Museum, which is a "must do" in Saigon. In reading about the place we had been warned that the photography was disturbing, so we decided not to push the kids to come along. We spent about an hour and a half looking at the photos and reading the captions  images of the war involving soldiers destroying villages and killing women and children, of course, featured heavily, as expected. But the area I found most disturbing contained a multitude of photos of children born with birth defects as a result of Agent Orange contamination  many of them were missing limbs or severely deformed. The images of burn victims from napalm were also horrifying. On the upper floor was a series of photos taken by various journalists who stayed with the soldiers in the field  I was shocked by how many of the journalists died in the war themselves. Of course, much rhetoric is devoted to the evil Americans and the imperialist attitude which brought them to Vietnam to prevent the country from unifying. From there we stopped in a few art galleries, where we found quite a few paintings we liked and at decent prices. But it was time to get back to the kids, though a swim was taken off the agenda due to the thunderstorm that arrived! That evening the kids had room service and Daniel and I tried a nearby restaurant that is very famous, called Ngon, which apparently means delicious. Well, the atmosphere was lively and the staff were very sweet, but the food was only average. Since the meal cost about $15, we weren't too upset, but I was starting to wonder where all the good food was! I also took the plunge and tried the local wine, called Dalat White  Daniel and I agreed that it was the worst wine we'd ever tasted! Someone suggested to me that it was made for different palates, but I can't imagine whose palate would appreciate drinking vinegar. With the departure for Can Tho scheduled for 8am, we unfortunately only woke up at 7:30am, having not yet packed up. Daniel sent me downstairs for breakfast with the kids while he attacked the packing job  it worked out pretty well, since we were ready to go by 8:30am in the end, only a half an hour late. Our guide, Siu, was from the central highlands of Vietnam and a very cheerful guy. The plan was to drive for 2 1/2 hours, then change to a sampan (traditional Vietnamese river boat) to see some of the markets and float down to a nice hotel for lunch, then reboard the sampan for an hour before returning to the van for the last hour and a half of the journey. Although we set off late, we were doing very well until we encountered a bridge which was down to one lane due to repairs  we waited nearly 1 1/2 hours just for our turn to cross it! So lunch ended up being delayed until about 3pm. Still, the Cai Be Princess Cruise was amazing, and lunch at Le Longanie was absolutely delicious. We finally found the good food! After lunch we continued on the boat, with a quick stop to try freshly made coconut candy. We got to the hotel pretty late, though, and Felix was beginning to feel unwell. Daniel had scheduled a cooking lesson for him the next day, but he was just in no condition to attend. He was pretty upset when Daniel took Miranda in his place, but we all enjoyed the delicious food they made for lunch! Because Felix was so unwell, we ended up spending the rest of the day in the room and even ordered room service for dinner. After a full day of rest, Felix seemed to be improving, so we agreed that the next morning we would arise early and venture out to the floating market  after all, it's the highlight of the Mekong Delta! So we managed to wake up at 6:30am and be ready to go by 7am, carrying a few muffins and pieces of fruit from the breakfast buffet. Our guide, Thon, was a student at the local university  a very enthusiastic chap who is studying English and Marketing. He was very chatty and told us about his village, which is located on the border with Cambodia, and where all the residents are given a special ID card allowing them free access across the border, as long as they return the same day. He was also quite knowledgeable about the lifestyle of the people who utilize the floating market for their livelihood. The river was so dense with boats that at some times it was difficult to even see the water! After experiencing the floating market, the boat took us to a fruit orchard, where all the local fruits are grown. At the end of the tour we were give samples of pineapple, mango and papaya, which we really enjoyed! From there Thom took us to a place where the boats are built. We had to get off the boat and walk about 5-minutes to the boat-building shop, where they also kept a number of pigs  it was an interesting place. After that we returned to the Victoria resort to rest for the afternoon and give the boys an opportunity to do some more school work. That evening we hopped on the shuttle boat into town and walked around. The town itself was nothing special, but I'm glad we had a look. We finally found a restaurant that seemed suitable for dinner, and they had a table for us on the upper floor's balcony, overlooking the road which runs along the river. The food was quite good and not too expensive, so we were pleased that we'd made the effort to go out  the kids also really enjoyed the "adventure" of trying somewhere new! Unbelievably, that was our final night before moving on to Hanoi. The time was passing so quickly, we couldn't believe it  with a total of 3 weeks in Vietnam, we'd already nearly finished the first one! Just a few general thoughts on Asia so far. The main surprise is how expensive it is! And although the countries are all priced differently, it all adds up to us spending more money than we expected. Granted, we have been staying at almost exclusively very nice places. In India, the hotels cost more than expected in general, but most hotels included breakfast and many included other meals as well. Plus the food in India was overall very reasonably priced and overwhelmingly delicious. Having said that, big city hotels, where we spent a lot to eat in their restaurants, were the exception, price-wise. In Shanghai, the hotel was not cheap, and neither was the food  I wonder how those people live. And here in Vietnam, the hotels appear to be quite cheap, but that is only the room rate  many hotels have additional charges for rollaway beds, as well as a lot of tax. The food is also a lot of money for very average quality, in many cases. Again, I don't know how the local people live, since even the snacks we've bought in the market has not been cheap. We are very surprised that overall we spent much less to travel around Australia and New Zealand! And I feel that wine deserves its own paragraph. I know that we were spoiled by 6 months in Australia and New Zealand, where fantastic wine is not only readily available but very reasonably priced. Of course I didn't have the same expectations from Asia, but I have to admit that the effort of finding a decent bottle of wine for less than $100 has become tiring. I've concluded that the only solution is to drink less frequently and save up for a really nice bottle once in awhile! At least in India they were able to offer a local alternative which is reasonably priced and very drinkable. As I mentioned, the local option here is Vietnam was the worst wine I'd ever tried! The other issue, which is impossible to ignore, is what happens when ordering wine by the glass. I first noticed in India that ordering a glass of wine was risky  first of all because the white wine is not kept cold once it is opened (and we all know how disappointing warm white wine can be), but also because they seem to have a goal of getting at least 8 glasses of wine from each bottle! In one instance my surprise must have shown on my face, because the woman who poured it explained that the large size of the glass was simply making the amount of wine appear small. I politely pointed out that the restaurant would be wise to serve wine in a smaller glass to avoid that confusion in future. Whenever I order a glass of wine, I now prepare myself for a small amount. On the rare occasion when a normal amount is poured then I am pleasantly surprised! But in most cases, I just order a bottle and avoid the whole issue. I hope this doesn't sound like a major preoccupation  I really do have some perspective! Click on any picture below to launch a gallery of pics from from Ho Chi Minh City and Can Tho. 30-May-09: Just left Hanoi for Sapa in the mountains in Northern Vietnam. 27-May-09 :: After bidding farewell to Hazel and her family, we rushed through security to board our flight and before we knew it we were in Manila beginning our Aman experience. A staff member met us at the domestic terminal and loaded our bags to be transferred to the Amanpulo private air lounge, a short drive away on the opposite side of the airport. Having thought we were in for a 3-hour wait, we settled in at the lounge and produced laptops and toys, only to be told that the early flight had waited for us! So we made it to the resort and into our rooms by 3pm, which meant that we had some time on the beach. Each beach "casita" has its own golf cart, seating 4 people, so we hopped in our carts and headed for the beach club. The kids and I grabbed a couple of kayaks and paddled out to one of the buoys which marks a snorkel spot  we had such fun splashing around and looking at the fish! One of the staff at the beach club had offered us some stale bread to feed the fish, so we took turns throwing it out and attracting the beautiful fish. By the time we returned to shore the sun was beginning to set and it was time to return to the casita to get ready for dinner. With 3 different restaurants serving dinner, we decided to try each one and return to our favorite for the final night's meal. The first evening we headed off to the Clubhouse in our carts, where we had a lovely continental meal served indoors. Next morning, we had breakfast at the Clubhouse as well, but were happy to be offered an outdoor table. After breakfast, the kids wanted to try windsurfing, so off they went to the windy side of the island. There was also a morning snorkeling trip at 10am, where we swam around on the south side of the island and spotted about 4 turtles, which was quite exciting. Meanwhile, Daniel went to the dive shop to find out the options. The wind was coming from the north, which made the best dive sites a bit too rough to access, so Steve (the British dive master) suggested to Daniel that we dive on the south side of the island. Ben was suffering from a head cold and advised not to dive, so Daniel and Felix went off on their own. The rest of us chilled out in the casita, avoiding the strongest sun of the day, and I snuck off for a long massage. When Daniel and Felix returned we got ready for dinner and headed off to the Beach Club for our second dinner, which gave us a chance to sit outside and enjoy the lovely weather. The menu is Spanish and includes tapas, but we still somehow ended up over-ordering. Everything sounded so delicious on the menu! On the morning of our third day, we tried a dive in the late morning. The conditions were quite nice and the dive site was only a 5-minute boat ride from the dive hut, which was great. We saw lots of fish, some lobsters and a couple of turtles, which are always a delight to watch. By the time we returned everyone was hungry and we filled up on lunch at the Beach Club, then returned to our casita for a break from the sun. Miranda and I went on the 2pm snorkeling trip, which involved a lot more swimming than the morning trip. We were able to see the giant clam opening and closing its mouth, and to swim past the floating bar. Later in the afternoon we proceeded to the Clubhouse to try out the pool. Everyone brought along a smart outfit so that we could go directly to the Lagoon Club for dinner, another outdoor venue where the theme was Vietnamese food and everything was delicious! On the morning of our last full day the good diving sites were still not available, due to the weather, so we passed on the opportunity to dive the same location again. By the time we got to the Beach Club for breakfast it was after 10am, and as we headed onto the beach again I noticed that everyone showed the signs of a bit too much sun exposure from the day before. We all put on extra sun cream and wore our SPF swim tops, but I was still concerned about the strength of the sun. We spent the day floating around in the kayaks, and this time Daniel took Miranda and Ben on the afternoon snorkeling trip, while the rest of us chilled in our casita. Since the dinner at the Beach Club was the favorite, we returned there for our final night. We had one more breakfast at the Clubhouse, while our bags were collected from the casitas and moved to the airport for our flight. Then it was back to the "mainland"! After 4 days relaxing on the island, we were ready to move on. The flight back to Manila offered some great photo opportunities, so the photographers in the family were happy. We reached the Amanpulo private lounge, recovered the bags we had stored, and waited for the shuttle from the Peninsula to arrive. The hotel was only about a 20-minute drive, and we were settled in to our rooms before noon. Having a suite on the club floor was ideal, since Daniel had decided to visit Corregidor on his own, rather than subject the kids to the long tour. The snacks in the club room (which was conveniently in the next room to us) were ideal for us, since the plan was for the kids to spend as much time doing school work as possible. So that afternoon everyone was very productive, with the promise of a trip to the cinema in the evening as a reward. By 5pm, we were heading out the door to find some dinner and see the new Star Trek film. The discovery of Bubba Gump caused great excitement among the kids, who have fond memories of eating there in Breckenridge. The food did not come as quickly as I'd hoped  although the restaurant appeared to have plenty of staff, nobody seemed to be doing much of anything. So after a decent meal and a delicious margarita, I was very excited to take in the first Star Trek film in years  and we were not disappointed! Next morning, Daniel arose at 6am (ouch!) to catch a ride to the ferry for his tour, and we did not see him again until 5pm. The kids and I stayed in the suite all day, with only short snack breaks, and they were very industrious. By 4:30pm I felt they had done enough and we headed down to the swimming pool to burn off some energy. As we exited the hotel, we discovered that it was raining  fortunately the kids didn't let that stop them from getting in the pool. After Daniel returned I managed to squeeze in a quick workout in the gymnasium. We were happy to allow the kids to have room service for dinner after a long day of work, while Daniel and I went downstairs to try the hotel restaurant. Daniel was also tired after a long day and admitted that the tour would have been too much for the kids. Our flight Monday was not until 1pm, so the kids managed about another hour of school work while Daniel and I packed up so that we could leave the hotel by 10:45am or so. At the airport everyone was running around trying to spend their last few pesos at the shops! Before we knew it, our flight was being announced and it was time to board. Click on any picture below to launch a gallery of pics from Pamalican and Manila. 26-May-09 :: In keeping with our family policy, we spent the 3 1/2 hour flight from Shanghai to Manila, on Philippine Airlines, in economy. The time passed quickly (it always helps when a half-decent meal is served!) but we arrived amidst heavy rains, the precursor to a tropical storm headed for the city. By the time we reached the Sofitel and checked in, the time was already 9pm and the plan was to get to bed as quickly as possible. As usual, we had to wait for extra beds and someone to open the interconnecting doors between our rooms, so nobody managed to get into bed before 10pm. Daniel had hoped to take a trip to Corregidor in the morning, but with a 7am start that seemed unlikely. As it was still raining when we woke up, everyone was relieved to have slept instead. After a huge buffet breakfast, our next mission was to book a domestic flight to Bacolod, where Hazel lives. Daniel had tried to do it on-line, but apparently the website doesn't accept international credit cards so he had to book through a travel agent in person. Amazingly, he managed to get us all on a flight that afternoon, which meant packing up pretty much straight away and heading back to the airport! We reached Bacolod by 3:30 in the afternoon, where it was hot and sunny, and Hazel was waiting to pick us up from the airport with her husband, Jorge, and her son, Ythan. We came directly to the Nature's Village Resort and unloaded our luggage, then went to see Hazel and Jorge's house, which is just a 5-minute drive away. Their house is lovely, located in a very cute development not far from the hotel where we were staying. They have also just bought a new Toyota, so their jeep was available for us to borrow during our stay. I can't say enough about Philippine hospitality  Hazel and Jorge spent all of their time with us during our stay and went to a great deal of effort to make sure that we enjoyed ourselves and were comfortable. In addition, Hazel's parents (Ethel and Ben, who we also know from Bermuda) were back for a visit and they also welcomed us into their home for a Mothers Day dinner and gave souvenirs to all the children. Hazel and Jorge hosted a big BBQ at their house one evening, with the most delicious fish on the menu, after bringing a huge group of family members to the hotel on Miranda's birthday to help celebrate. On Saturday we drove out to the Mambucal Mountain resort for the day, in a convoy of four vehicles! The drive was lovely, passing through several very picturesque Philippine villages, and the temperature at the mountain resort was a bit cooler than in the city. The kids hired a paddle boat for about an hour, after which they were very sweaty, and then got in the swimming pool. We camped out in a picnic pavilion and dug into the huge picnic lunch that Hazel had prepared. The resort is also the site of seven waterfalls, and Jorge secured a guide to take us up. The hike to the first waterfall was about 15-minutes, and from then on we climbed for about 5 minutes between each of the next 5 waterfalls. When we reached the 6th fall there were lots of people swimming in the pools and enjoying the water. Our guide took his shirt off and stood on a cliff  then did a back flip into the pool below! It was so surprising and impressive. For the walk back down we took a different route which didn't closely follow the water, allowing us to avoid all the people on their way up. The hike down took a surprisingly long time, and by the time we reached the picnic site again, everyone else was wrapping up. The time was nearing 5pm and Daniel was keen to reach the hotel before dark. So we managed to collect all the kids and load up the cars  quite a production with the large number of people! We enjoyed the drive back and saw a beautiful sunset just as we reached the hotel. Daniel went out to pick up some pizza for a light takeaway dinner and we all went to bed early. On Sunday afternoon the boys went to see a movie, Wolverine, while Hazel and I wandered around the mall with the girls. And on our final day, Monday, Daniel and I took some of our stuff to DHL to send it back to Vermont to store  a few souvenirs that we didn't feel like carrying around anymore. Then we went to the mall to visit the travel agent and book flights from Manila to Ho Chi Minh City for our next leg. We really enjoyed having access to the local supermarket (located in the mall) while we were there, and bought some crackers and fruit for the following morning, when we had to head to the airport. On our final evening in Bacolod, Jorge chose a special restaurant to take us to. We drove about a half an hour to a restaurant serving typical Philippine food, which includes lots of pork and rice, as well as seafood. The highlight for our kids was the ice cream, which came in a large sundae dish, but Ythan had filled up on the main course and didn't want any. On our final morning Hazel, Jorge and Ythan came to the hotel to help us load up our luggage and take us to the airport. As we approached the airport we realized that the golf bag was missing and before we could think too hard about it, Ben raced off back to the hotel to it. In the meantime, we started to wonder if we'd actually brought it when we arrived at the airport 5 days ago! On a whim, we asked the Philippine Airlines staff and it was found in the back room! So poor Ben raced all the way back to the hotel for no reason. The kids were sad to leave Hazel and we ended up having a rather prolonged farewell because of how long it took to track down the golf clubs and fill in the paper work. But we will always have great memories of our visit! Click on any picture below to launch a gallery of pics from Bacolod, Philippines. 25-May-09 :: Although the timing of the flight from Delhi to Hong Kong was not the best (11:45pm departure and 7:30am arrival), we were very comfortable on Cathay Pacific. When we deplaned, the Four Seasons gave us a pleasant surprise by greeting us with 2 of those electronic carts to take us from the gate to the immigration counter! The same helpers were there to meet us after we had our passports stamped, collecting our luggage and getting us loaded up in the vans to the hotel. That was definitely the most painless early morning arrival experience! And at the hotel, our rooms were ready when we arrived, with the extra beds for the girls already in place. Good old Four Seasons! We called down to room service immediately for some breakfast, since everyone was starving. In the meantime I rang Clare's room to announce our arrival and she came down with Trudy and the kids to give us a welcome hug! It was so nice to see them. After the kids got reacquainted, Daniel and Benjamin decided to go off for a haircut and took Edward with them. Ben's haircut got a bit out of hand, ending up shorter than expected  fortunately Edward's haircut turned out very cute, since I think it was shorter than Clare anticipated. After a bit of shopping in the malls adjoining the hotel, we all met up for lunch. Diane, who is married to one of Philip's colleagues, met us there and we ended up spending a lot of time together over the next few days  she is really good company! That afternoon we ladies (Clare, Diane and I) filled in the time wandering around the malls which are all connected  Clare needed a pair of shoes to wear with a brown dress, and I had lipstick and various other make-up and skin care items that needed replacing. I also managed to get a new toothbrush charger for the kids! By the evening we were all pretty tired, but found the energy to have a lovely Japanese meal at Inagiku, one of the restaurants located in the hotel. Clare stopped in to tell me and Daniel that she was off to Kowloon to meet her dad, Paul, and Sylvia, his girlfriend. So we took the kids up to the room and tucked them into bed and went off to meet them for a drink. It wasn't a terribly late night, but given how little sleep we had on the flight over, it seemed pretty late! The next morning was Tuesday and Philip was still having meetings all day, so we met up with Paul and Sylvia and took a few cabs to Stanley market. The crowds were not bad and the kids enjoyed wandering around the stalls and choosing little gifts for each other. After stopping for a bite to eat, we made our way to Repulse Bay and camped out on the beach, enjoying the lovely weather! At first we had unfortunately positioned ourselves directly in the path where tour buses unload and visitors walk down to the waterfront  this meant that the kids were being swarmed by well-meaning but clueless Chinese tourists from the mainland who had perhaps never seen blond hair before. Once we moved down to the more deserted end of the beach things were much more pleasant and the kids enjoyed playing together in the sand! Back at the hotel, we took the kids down to the pool for a dip. Unfortunately the breeze off the harbor made it quite chilly on the pool deck, so the kids ended up spending all their time in the hot tub. They then had dinner at the pool side restaurant and we carried on upstairs to get dressed for an evening out! At some point that day Edward decided that Felix was his best friend, which was so sweet. Paul had arranged tickets for all of us on a harbor cruise, sitting on a beautiful Chinese junk. The cruise departed from pier 9 at 7:45pm, so we were there and ready. After enjoying our "welcome" drink, we sat back to enjoy the light show  at 8pm on the dot all the harbor side buildings participated in a symphony of lights! We were all very impressed. After taking the kids back to the room for bed, Daniel joined the rest of us at a Thai restaurant nearby the hotel, where we started on the white wine. Paul and Sylvia had already eaten, so they joined us for a snack and a drink but decided to head back to their hotel early. Clare had found a list of bars located Staunton Street in Central that she was keen to see, so Daniel, Clare, Diane and I walked on up the hill to see this famous place. Obviously from the outside nothing looked particularly special, and Clare insisted that all she wanted to do was to see the place and then we could go back to the hotel. But Daniel insisted that we have a drink in one of the many bars, and chose an interesting place with lacey curtains covering the windows from inside. The "Feather Boa" was happening inside  everyone seemed to be holding glasses containing brightly colored drinks! We ordered a round and settled in, and Clare struck up a conversation with some Cathay Pacific pilots. I was telling one of the pilots, Nick, that my son was interested in flying and he suggested that he'd enjoy visiting the flight simulator used for pilot training. What a great idea! I wasn't sure if there was enough time to arrange it before our departure, but wanted to keep it in mind. Diane had put her nice handbag on the floor, so I'd picked it up to put it on a table instead (thinking that I was saving it from abuse! ), but when I next looked the candle on the table had been dripping on her bag for awhile and made a huge mess! I felt so awful, since her bag was really nice. By the time we had a few drinks there and walked back to the Four Seasons, it ended up being a pretty late night. Wednesday Trudy had offered to take all six kids out for the morning, so I took mine down to meet her at about 10am (though it was rather painful for me to get up!). Off they went on the Star Ferry and across to Kowloon, where they followed a pedestrian path to the History Museum. I had come to the realization that we would need visas to visit Shanghai (our tickets were for 2 days later!). After checking on the situation on-line and feeling less than hopeful, I decided to take advantage of the concierge service. To my relief, Caroline at the concierge desk assured me that obtaining visas for the 6 of us by the following day would be no problem. Of course, I didn't bother to ask about the cost, which Daniel only discovered (to his dismay) as we checked out! The cost is much higher for US passport holders, and since the kids UK passports have expired, that put the cost up. Later that morning, the adults nursed hangovers in a coffee shop nearby the hotel, after which Clare, Diane and I went off shopping again! Later that afternoon, Clare and I took the kids to a local playground to burn off some energy, then I went down to the salon to have my hair done while everyone else got ready to go out. Since it was Felix's birthday, I had reserved a table at "Felix", the trendy restaurant on top of the Peninsula Hotel. Although their policy prohibits children under the age of 12, they had made an exception for us because I mentioned that Felix really wants to be a chef. So Clare and Diane came along, as well as Paul and Sylvia, and we had quite a posh party for Felix's 11th birthday! After a lovely meal, we headed back to the Four Seasons to get the kids tucked up into bed before proceeding down to the cocktail bar where we found Diane's husband and some colleagues were having drinks. Another late night and we were exhausted. Fortunately, Thursday's schedule was pretty relaxing  Daniel took Felix to the driving range and to his flight simulator experience (turns out we were able to arrange it on short notice!). The rest of us stayed in the room, getting organized for our departure on Friday morning, then made a quick trip to the bookstore for a birthday gift for Clare's son Theo. That evening the kids were happy to eat down by the pool with Trudy and the boys, so Daniel and I had dinner on our own, back at the Japanese restaurant. Although our flight to Shanghai wasn't until noon, by the time the breakfast came from room-service, it was time to depart. Check-in was easy, and the flight was very pleasant on Dragon Air. Shanghai airport was very modern and I was surprised that there were no crowds even as we exited the airport! We were met by the staff from the Shangri-la Hotel, who were very efficient, and the drive was about 40 minutes. This was our first visit to the "real" China, and we were all curious to see how it might compare with Indian cities. Unfortunately, India comes off looking very third world compared with Shanghai, at least. We didn't see too much of the city on the drive, but we managed to get settled into our rooms quickly  Daniel headed off to the spa to have a sauna and I went to the gym for a quick run. That evening we met up with Philip's brother and his wife (Ashley and Tracy) as well as Clare's mother and her husband (Eileen and Aemon). We were all having a drink in the rooftop bar when Clare and Philip arrived to join us for a bit! After that it was several nights in a row of eating in Shanghai's top restaurants plus having drinks in our hotel bar! We ate at the Jean Georges restaurant in the Bund area, as well as another restaurant in the same building. Another dinner was in the tallest building in the city, which houses the Park Hyatt. The views from there were stunning, and we enjoyed a great meal. Our final dinner was to celebrate Clare's 40th and was held in the hotel's rooftop restaurant. I managed to visit the gym most every day we stayed there, and snuck in a visit to the spa and hair salon on the final day for a massage. So the high calorie food and extra alcohol didn't cause as much damage as they might have otherwise! Meanwhile, the kids managed to look after themselves pretty well. Since we had access to the Horizon Club, they were able to drop in anytime they want and help themselves to food, which was very convenient. Although the rooms were not adjoining, they were next door to each other and very spacious. The Shangri-La also offers complimentary internet access, so that kept the kids occupied. On the Sunday we also had a birthday party for Theo, Clare's younger son, who turned 2. The kids were so excited to have a real birthday party to attend, with hats and blowers! As for the city of Shanghai, we managed to see just enough to justify the stay. Unfortunately, the day we arrived was the start of the May 1st holiday weekend, when people from all over the countryside come into the city to celebrate. So the crowds on the streets were more intense than usual, and walking around was not much fun. Saturday morning we all braved the crowds and walked from our hotel to the riverbank, where there is a slow train going under the river, known as the tourist tunnel. The kids enjoyed the ride and when we came up on the other side we joined the flowing crowds pushing their way along the pavement. Daniel had looked at a map and guided us along a famous road where the Peace Hotel stands (currently under renovation), famous for housing Mao's headquarters at one time. We then wandered further along to the Hyatt Regency, where we had a drink in the lobby café and then split up. Those of us with tired kids headed back to the hotel, and the others remained out to brave the crowds and see more of the city. Sunday I decided it would be better for the kids to devote some time to studying before the birthday party, so that worked out well. And on Monday Philip very kindly arranged a tour bus for us to see some of the city. The first stop was Fangbang Road and the Yu Gardens, which was a lovely area. The crowds were still pretty intimidating, but it was mostly Japanese visitors. Our next stop was for some lunch  we went to Pizza Hut, which I think was an attempt by the guide to give us something familiar, but ironically there was almost nothing on the menu reminiscent of the Pizza Hut I know! Still, we managed to fill ourselves up and muster up the energy to visit the Jade Buddha, which is in northwestern Shanghai. The temple was lovely and the Buddha itself quite impressive (though we only got a 30-second glimpse). By the time we finished everyone was feeling exhausted, but our guide had one more place to take us  the government shop where all the jade carvings are sold. After that we at least felt that we'd seen some of the "real" Shanghai, and were satisfied. There is a lot of construction happening at the moment, adding infrastructure to manage the Expo 2010, so it would be interesting to return and see what the city looks like when all that is completed. At the moment, I wouldn't describe it as a beautiful city. Saying "good-bye" to Clare was tough, since we don't know when we'll see them again and we had such a lovely time together. The last thing we did before leaving was have our luggage sent ahead to the international airport so we could catch the Maglev, a magnetic train that travels up to 430 kph! It was a pretty exciting journey, even though it only lasts about 10-minutes. The train runs parallel to the motorway which goes out to the airport, so we were able to zoom past all the cars at speed. Although it probably didn't save us any time (the drive from the hotel to the entrance for the Maglev was about 20 minutes), we enjoyed the experience. The check-in procedure was a bit slow, but everything went smoothly and soon we were en route to Manila. Click on any picture below to launch a gallery of pics from Hong Kong and Shanghai. 22-May-09 :: Just arrived in Ho Chi Minh City and looking forward to just over three weeks here. 19-May-09 :: We arrived in Manila just ahead of a large typhoon, preceded by heavy rain. It was the first rain we'd encountered since our brief shower in Rajasthan! 19-May-09 :: The 5-hour drive from Banhavgarh to Khajuraho, back through the countryside of Madhya Pradesh, was very painless, and we made it to the hotel with plenty of time to have a swim before dinner. Since we missed seeing the famous temples at the beginning of the week, we were determined to make it there this time! So Saturday morning after breakfast we walked over to the entrance  although the village was not crowded in the way that we'd become accustomed to seeing in Indian cities, we managed to attract the interest of a small group of people who wanted to practice their English (which is just code for hoping to entice us to buy something in their shop) or get us to ride in their rickshaw. The temples, though visible from our hotel, were quite impressive up close and the family photographers were quite productive. In the late morning heat we were pleased to manage 1 1/2 hours there, after which we returned to the Lalit Temple View Hotel in order to squeeze in another visit to the pool before packing up to head to the airport. Unfortunately, the staff seemed to feel that knocking on the door before entering a guest's room wasn't necessary, so one of them had the unpleasant experience of walking in on my when I was not decent. That ruined an otherwise pleasant stay for me as well. The flight back to Delhi was delayed by about an hour, so everyone was feeling a bit hungry at the airport. The kids found a packet of digestive biscuits and a tube of Pringles, but the price was $10 for the 2 items! I asked a couple of the other shopkeepers in the airport and they helped us get the "Indian" price, rather than the "tourist" price, which was still rather high at $6, but at least everyone got a small snack. By the time we reached the domestic terminal of Indira Gandhi Airport, the time was nearly 5pm. After retrieving our luggage, we were met by the staff from the Aman Hotel, who started off the pampering by collecting us in their special Ambassador cars, fitted with beautiful maroon leather seats and a drinks cooler between the driver's and the passenger's seats! The drive to the hotel was pleasant, with the light Saturday evening traffic, and we pulled into the entrance at 6:25pm. Anthony was very kindly waiting to greet us when we arrived, and the kids enjoyed seeing a familiar face. Daniel had arranged to meet a fellow who is associated with an investment we have in India, Mr. Anil Agarwal, and he sent a text at that moment to say that he was already waiting in the hotel! Daniel went off with Mr. Agarwal to have a drink and Anthony took me and the kids up to our suite on the 7th floor, where we met our butler. Can I just say that Delhi is worth visiting if only to stay at this fantastic hotel! Our suite was not only incredibly spacious (plus we had several glasses of pomegranate juice as our welcome drink!) but it also contained a 2m square plunge pool on the balcony! My plan was to get the kids settled and head downstairs to join Daniel and Mr. Agarwal for a drink, but it took a good half an hour to learn our way around the suite and understand all the functions in the room, not to mention figuring out where to put all our luggage (the pieces from storage had also been delivered). So by the time I ordered some room service for the kids' dinner and made it back downstairs, Daniel had almost finished his discussion with Mr. Agarwal. Our plan for the remainder of the evening was to try the hotel restaurant which doesn't allow children and have an adult meal. So Daniel and I quickly freshened up and headed back downstairs while the kids got themselves settled into bed. Daniel and I were surprised (and a little disappointed) to learn that the main restaurant serves Spanish food, rather than Indian, but we got over it and managed to enjoy our meal of tiger prawns. The sommelier was a lovely lady from New Zealand who helped us chose a Spanish wine, which was a nice change from the local sauvignon blanc from Sula Vineyards! Upon returning to our floor, we learned that the kids had called upon the butler to remind them of how to turn off the lights. We then decided that it was important to take advantage of the opportunity to have a swim in our suite before bed! Once we finished the carpet shopping experience and arranged for them all to be shipped to Vermont, we returned to the hotel to box up the items we'd collecting during our time in India. I didn't get nearly as much fabric as I'd hoped, but there was still quite a bit to ship. I left Daniel in charge of that project and wandered down to the spa for my facial. An hour and half later I returned to the room to finish packing up, feeling very relaxed. We had just enough time to eat dinner before loading up the cars to head to the airport and catch our 11:45pm flight to Hong Kong. How to summarize our long stay in India? First of all, it was great to see the Dusejas  it's been at least 10 years since I saw any of them and much longer for most of them. Also, the weather was much more pleasant than we'd anticipated. Until the last few days of our stay we were pretty comfortable, and actually felt cold much more of the time than I'd expected. Even with the Indian heat wave receiving continuing coverage on the news, we felt that we were very lucky with the temperature during most of our stay. Toward the end I began to feel disappointed that we'd decided to come in April, when everything is so dry. I'd really like to make another visit in October or November, after the monsoon has turned everything green, and see what a difference that makes. But overall we were pleased with our well-thought-out itinerary. We spent very little time in the cities and managed a great combination of culture, history and wildlife. The other big disappointment was the amount of litter we saw everywhere. Ironically, the roads of the big cities were cleaner than I remembered, but rubbish lined the roads in much of the countryside and really ruined some of the better views in the mountains. I understand that the Indian government has probably got bigger issues to address, but I find it difficult to excuse such a lack of pride. As for our favorite places in South Asia, I'd have to say Bhutan is at the top of the list  we'll definitely be planning a longer visit there when the opportunity arises. But we also really enjoyed the Taj Safari lodges at Pench and Bandhavgarh National Parks  we look forward to visiting some of the affiliated lodges in Africa, as well as seeing where else Taj decides to open future lodges in India! Simla was probably the most relaxing, since the scenery was beautiful, the town was fairly calm, and the hotel had a great kids' entertainment room. And of course, Rajasthan is memorable both for the natural beauty and the fantastic company we had! The best spa has to be at Aman-i-Khas, simply because the massage therapist approached us rather than making me come and ask about appointments. But I also loved my experience at the Aman Delhi spa! We got a lot of pleasure out of all the swimming pools on the Rajasthan segment of the trip, so it's impossible to choose a favorite. The best gym was at the Aman in Delhi, but I didn't manage to get a workout in there. But I loved the gym at the Taj Mahal in Delhi as well, where the trainer kept offering me cold bottles of water and refreshing cool towels during my work out! And for best people, I'd have to say the Glenburn Tea Estate, where we met a surprisingly wide variety of friendly people and enjoyed communal dining. A close second was Amanbagh, where we met Anthony and his family, plus the staff were lovely to Francesca. And we also met quite a few interesting people at Mahua Kothi, in addition to the interesting staff. Like many of the other places we have visited, we look forward to coming back in the future and making it to some of the places that we couldn't fit into our itinerary on this occasion! Click on any picture below to launch a gallery of pics from our farewell to India. 14-May-09 :: We reached the Mahua Kothi lodge next to Bandhavgarh National Park at about 3:30pm, with our usual greeting of a moist cloth and a drink. We were sure that we'd missed the afternoon safari, and were wondering what to do with ourselves until everyone else returned and we could have dinner. But as we approached the lodge, all the other guests were just meeting their naturalists and preparing to head out. We met our dedicated naturalist, Himanshu, who informed us that it would be no problem to head out straight away for a drive around the park! So after taking a few minutes to direct our luggage to the appropriate rooms, we boarded our Tata jeep and headed off to the park entrance. In the afternoon, none of the jeeps are assigned driving routes, so after finding out where tigers had been spotted in the morning we drove to the designated spot. We hadn't been waiting long when we spotted our first tiger  a 14-year-old male who has long been dominant in the park! He was very large, and just walking calmly through the tall grass as we snapped photos of him. After he disappeared in the dense bush, we drove off to look at some watering holes and spot birds, monkeys and deer. Since we had left the lodge rather late, it was a short drive around and as we were heading back to the gates we came across another line of jeeps looking at a pretty 6-year-old female tiger just lying in the short grass about 30 feet from the road  our second tiger spotting of the day! So we returned to the lodge for dinner, very pleased with our first safari. We returned to our rooms to find a bath waiting (lovely  such a luxury to have a bathtub in the wilderness!) and cleaned up to eat a delicious Indian meal in the main dining room. The resort was surprisingly full, given that it's the low season for tourism. As we discovered during our stay, each group that left was quickly replaced by another group arriving and the lodge had 4 jeeps full of people out on every safari! Tuesday morning we arose at 5:30am to a pot of tea on our porch and headed off to the park by 6am. On the morning drive the jeeps are assigned a route, so we picked up our park guide and followed our assignment. We had been going for only about 5 minutes when we saw a jeep pulled over to the side, signaling us to stop and be quiet because there were 2 tigers lying in the bamboo just off the road! They didn't seem the least bit concerned by the fact that the jeeps were parked there watching them  the same old male from the previous day with a new female. They were apparently engaged in some kind of courtship ritual, but not actually mating. Still, seeing 2 tigers together is pretty unusual, so we felt very lucky. The best part was that only 2 more jeeps turned up so we had a rather peaceful morning just watching the 2 of them  at one point they got up and walked across the road, only to lie down again on the other side in a spot where we had a much clearer view of them! Basically the week went on like that  we were fortunate to have at least 2 viewings on each safari, morning and evening! In the end we saw 8 different tigers, and encountered the same old male tiger on 4 different occasions. On Wednesday morning a new male was spotted in some tall grass, just far enough away from the road that he was difficult to see. So the elephants made an appearance and gave all the passengers from about 10 jeeps an opportunity to ride on the elephants' backs and see the tiger! Daniel and I squeezed onto an elephant's back with the kids, which made for rather uncomfortable conditions, but we ended up amazingly close to the tiger. All in all, a very successful safari trip, by any standards! In addition, we sighted several eagles and some vultures, and a few colourful storks, as well as other interesting birds. The afternoons, between safaris, were pretty hot, so the kids passed the time by reading, doing a marginal amount of school work and cooling off in the swimming pool. In the evenings, we enjoyed dining in different venues each night, with some local tribal dancers and singers for entertainment on the last evening. On Wednesday afternoon, we drove out to a watering hole where a female and her 3 cubs (which are 14 months old, so the same size as a fully grown adult) had been spotted in the morning. The watering hole was pretty packed with other jeeps waiting, so we decided to drive around the back side and see what was happening. Just as we reached the back of the watering hole, we spotted 3 tigers on the rocks heading away from the water, which ended up being the female and 2 of her cubs  what a lucky sighting! To see 3 tigers together is extremely unusual, so we watched them until they climbed too high on the opposite hillside to be visible anymore. On Thursday morning the kids were too tired to get up, so we left them to sleep and went off on our own. Our assignment for the day was to visit the Bandhavgarh Fort, which is located on top of a large hill in the center of the park. The climb was very steep, but from the top it was possible to see for miles and miles. We could see some of the watering holes where we had waited for tigers to appear, and a couple of jeeps driving around on various roads. The Malabar Pied Hornbills (unusual looking birds) were also very active on top of the hill, and Daniel managed to get a good photo of one perched in a tree. The fort contains quite a few temples, some of which are overgrown with trees and vines, and some large man-made watering holes. The view was amazing, but that was the only safari outing during which we didn't see any tigers! On our final morning, the girls and I slept in while Daniel and the boys went out for the final safari with Himanshu. When they returned we had breakfast together and finished packing up our cottages. I took the kids to the pool for a final swim before the cars arrived to take us back to Khajuraho, but it was already getting really hot! We were finally starting to feel the effects of the Indian heat wave, which we had so far managed to avoid by getting up early and resting in the afternoon. In no time at all, the cars were loaded and we were waving good-bye to the lovely staff at the lodge. Click on any picture below to launch a gallery of pics from Bandhavgarh. 11-May-09 :: After saying good-bye to Simon, Debbie and the boys we were all taken over by exhaustion. Unfortunately, our first morning without them was an 8:30am departure for the airport, so there was no time to sleep late and relax. After a final buffet breakfast at the Taj Mahal Hotel in Delhi, we loaded up the luggage into the cars and set off. As we planned to return to Delhi for our final night in India, we decided to stay at the new Aman Delhi instead of the Taj, and Daniel and the girls took a few extra bags to store there for the week. The boys and I headed off to the airport to get the check-in process started and wait for them. The domestic airport in Delhi is not my favorite, but they are working on a new airport which is meant to be completed by Sept. 2010 for the Commonwealth Games. I'm sure it will be a big improvement! Eventually we boarded our flight for Varanasi, a fairly full 737 which took just 1 hour. Now Varanasi airport has obviously not been touched in 30 years or so  the luggage carousel is only about 20 feet long and the room has barely enough space for all the passengers to wait. When we finally collected our bags, we found our waiting cars and loaded up. The drive to the hotel was about 35 minutes, and what we saw of the city was consistent with the airport. The city is very old (I read somewhere that it is the oldest consistently occupied city in the world  is that possible?) and there certainly isn't much evidence that it has participated in the economic boom which has been obvious in the rest of the places we have visited. However, our hotel was a completely incongruous oasis in the middle of the ancient city! Because it's a Taj hotel I was assuming that the Nadesar Palace would be a typical large city hotel. In actuality it is a recently (only finished 2 months ago!) renovated palace located on a huge landscaped plot of land, providing lots of privacy. And it only has 10 rooms! Daniel and I were put the Bhutan Room, which made us happy, and the kids were given a room named after a famous visitor to the palace from some point in history. In looking around the palace, we were in awe of the beauty of the building and the well-thought-out furnishings. Many of the fabrics were obviously found locally, as Varanasi is famous for silk brocade, but they had been combined so tastefully and the interior of the building itself was so perfect, from the woodwork on the doors to the banister on the staircase. The spa was also very impressive, with huge bathtubs in many of the treatment rooms, not to mention the beautiful wood furniture (not overly ornate) that was scattered about. Daniel and I are starting to work on furnishing the house in Vermont, so we suddenly notice these things more! Of course, the main attraction in Varanasi is the Ganges River. As with many attractions, the best time to go is either dawn or dusk, so Daniel and I decided to have a massage in the spa and then head out to the river for dusk. The manager of our hotel did not recommend taking the children, as he warned us that the crowds would be quite intense in the evening, so they all stayed back and worked on some school lessons. Our spa experience was perfect  so relaxing and with the most beautiful smells! We then got in the taxi to head to the Ghats, as the steps down to the river are known. I later learned that there are 87 different sets of Ghats, each with its own name! The driver parked in a designated car park and introduced us to our guide, Mr. Dilip Kumar, who has spent his entire life in Varanasi. We declined his offer of a boat ride on the river, promising to come back and take the boat ride another day, but were pleased to have his company to guide us around the area. The walk from the car park was pretty long and intense, through dense crowds of people, bicycle rickshaws and shops. After about 20 minutes we reached a narrow corridor which led to the river, where people were beginning to gather in large groups for the evening festivities. It seems that every day is some sort of festival! Since we had declined the boat ride, we wandered along the top of the Ghats with Dilip and learned about the different maharajas who had built palaces along the river in the hope of some spiritual credit. Many of them are dilapidated or have been destroyed, but some of them are still in use. As darkness set in, we approached the end where the cremations take place and there is a group of people in charge of maintaining the eternal fire used to light the pyre. The amount of firewood stacked around the place was just crazy, and the smell of sandalwood, in particular, was quite strong. Apparently only wealthy people can afford for their loved ones to be burned entirely with sandalwood, but small amounts of sandalwood powder are available for less money and give the aroma of the lovely wood, at least. We returned to the hotel by 7:30pm, and had a lovely dinner of BBQ tandoori fish, chicken and lamb with the kids, sat outside on the pool deck. After some ice cream we managed to get the kids into bed and in the morning we were back at the same table for a lovely breakfast. Soon after, a horse and carriage arrived, which took the girls for a ride around the property. By that time it was getting a bit hot outside, so we retreated into our lovely rooms. Daniel and I had arranged for a driver to take us shopping for silk, for which Varanasi is also well-known, so we settled the kids into their room with some school work and headed out. As with most things, the shop owners wanted to show us everything except the things which we actually wanted to buy, but I managed to pick out a few silk scarves as gifts, as well as one for myself. We then proceeded to another shop, where we found some nice cotton fabric that might be suitable for curtains. The price was good, so we took a chance and bought it to ship back to Vermont. I could have spent more time doing that, but Daniel wasn't convinced of the value. So I bought a small piece of silk fabric and later wished I'd bought much more! We were back at the hotel in time to enjoy some tea in the beautiful lounge before dinner, after which we repeated the menu from the previous night, eating a bit earlier. Then we asked for a wake-up call with some tea at 4:45am, since we'd decided to brave the morning boat ride on the Ganges. The kids were just not interested in getting up that early, so we left them to sleep and headed off. Although the crowds were much less than the evening, it was unbelievable, really, how many people were already about at 5/5:30am! The car was able to park a bit closer to the Ghats this time, but I was still pleased that we'd come without the kids. The rowboat ride was surprisingly peaceful, given the activity level on shore. We enjoyed the information that Dilip was able to share with us about the city and the activities  he told us about the Brahmins performing poojas for people for various reasons, ranging from hopes for improved health to a wish for increased wealth. One tradition is to buy a small candle surrounded by marigolds to light and float down the river. So we bought one large bunch of candles for our family, plus an extra in honour of a friend. Daniel got some nice photos of our spiritual candles floating down the Ganges. We returned to the hotel to find the kids just waking up and entertaining themselves, so we slowly made our way down to breakfast at the outdoor table next to the pool again. The girls had another ride in the horse-drawn carriage, and we packed up to head to the airport. Our flight was quick and our arrival in Khajuraho, in northern Madhya Pradesh, was on time. Since it is a small village, the ride from the airport to the Lalit Temple View hotel was only about 10-minutes and there was no traffic. A welcome relief after Varanasi! Still, the temperature was in the 40s (Celsius) and walking around to view the temples had to be postponed until another time. Daniel and I were still exhausted after our early morning excursion, so I left him to have a nap in the room while I took the kids to the pool. It looked very nice, but the tiles were a bit dirty and there was no shallow area for Francesca to play. Still, the kids played with the frisbee for awhile (Auntie Debbie had kindly left it with us, insisting that they could easily replace it back home!) in the pool and then on the grass, as the grounds were absolutely beautiful. I finally managed to drag the kids back to the room for showers and then it was off to the restaurant (where I think we were the only diners!) for an early dinner and bed. On Monday morning we stored a bit of luggage at the hotel and, after a large breakfast of pancakes, the drivers arrived to take us to Bandhavgarh National Park, about 230 km south east. None of us was looking forward to the 5-hour drive, but as we were checking out of the hotel we spoke to another couple who had just come back from the park and seen 12 tigers! So with that encouraging news, we set off feeling more tolerant of the time in the car. We drove past another park, Panna National Park, which is very close to Khajuraho, but unfortunately it's nearly impossible to see a tiger there. From there we carried on through more villages and across vast tracts of empty countryside. The feel was very different to when we drove from Nagpur to Pench National Park, in southern Madhya Pradesh. One of the cars got a flat tire and we had to stop for repairs for about 20-minutes, but otherwise the drive was uneventful. Click on any picture below to launch a gallery of pics from Varanasi. 05-May-09 :: Driving onto the property at Amanbagh, located in the Ajabgarh Valley of Rajasthan, was like entering a fairy tale! The grounds were all green and lush, the gardens were perfectly manicured, and the building was absolutely beautiful, but without detracting from the natural surroundings. We received another warm welcome, complete with wet hand towels and the performance of a traditional song by some of the staff. As we walked around the grounds, we couldn't help but be impressed by the two swimming pools  our rooms were also very stylish and luxurious! First on the agenda was a swim. The kids at first gravitated toward the large swimming pool, but after discovering that the smaller pool had different levels in it (very conducive to frisbee and sumo wrestling) we decided to establish ourselves there. With 7 kids we basically took over the entire pool anyway. After 3 nights in Ranthambore, where the schedule had been pretty busy, we were all counting on a bit of relaxation at Amanbagh. That evening we all familiarized ourselves with the menu and made ourselves comfortable at the largest table on the terrace. As we'd all had an early morning, nobody needed coaxing to get to bed early as well! Having promised the kids a morning to sleep as late as they like, we made no plans for Friday morning. At breakfast we noticed a boy hanging around with a soccer ball, looking as though he'd like someone to play with him. It turns out that William was visiting with his parents and sister from Delhi, where his father is the general manager of the new Aman hotel there. So it was agreed that we would all meet William at the front of the hotel for a big soccer match on the beautifully manicured lawn! After running around in the sun for an hour or so everyone was ready to cool off in the pool, giving me a chance to visit the gymnasium for a bit. The adults all managed to book appointments for a complimentary foot or head massage  Simon had the head massage and warned us that it was just a bit too much aggressive attention to one's head, so the rest of us opted for the foot massage! After that the staff informed us that a treasure hunt had been prepared for the children, who happily went off in search of goodies. Our plan was to try one of the local walks, and we waited and waited for the children to return from the treasure hunt so that we could all go together. When they still hadn't returned by 5:15pm, we were told we should carry on and that the children would be looked after in our absence. So we had a short drive and then our guide showed us a path through the hills to a lake  the incline was just enough to be a bit of exercise, and the heat dissipated as the sun went down. When we reached the lake, with a small temple overlooking it, I couldn't believe how much rubbish was lying around. As our guides kindly brought out some lemonade and brownies for us to snack on, I walked around collecting litter to take back and throw away. Amongst the rubbish there are typically numerous plastic shopping bags, so finding a bag in which to collect litter was no problem. By the time we returned to the jeep we had filled 2 shopping bags, and I felt satisfied Back at the resort, the kids had finished their treasure hunt and were relaxing in the rooms. We gathered everyone up and went to our usual table for dinner. Everyone ordered a thali, a traditional Indian tray with small bowls set on top, all made of stainless steel. I ordered mine with fish, which was one of the most delicious meals I've ever had! Debbie had the prawns, which she claimed were also excellent. After discussing with the manager the various options for a morning outing, we settled upon a climb up to the "King's Throne", which sounded intriguing. We requested tea and a wake up knock at 7am and headed off for another early night in bed! The next morning we gathered at the front entrance by 7:15am, joined by William and his father, Anthony. When the staff saw all the children, they warned us that the walk was not suitable for them, so we left Francesca in their care and headed off. The original plan was to walk along the road to the place where the path begins, but we decided to drive there and walk back instead. When the jeeps dropped us off at the start of the path up to the King's Throne, I was again struck by the amount of rubbish. Once again, I picked up some empty plastic shopping bags and began filling them with litter as we walked  this time joined by Miranda and Debbie. As long as the path was not steep, we were able to pick up loads of stuff, but we took a break when the steps began to require more concentration. The way to the top had a few parts which required holding onto branches and very large rocks to climb, so I was relieved we'd left Francesca behind. But the top was not too far up and we reached the throne quite quickly. Daniel took photos of everyone having a turn at being the king, and then we headed back down the cliff. Apparently, the king would sit there with his gun and wait, while his staff herded tigers into the open space in front of him. When the tigers appeared, he would shoot them! No wonder the tigers numbers are so small now. The walk back to the resort was through some agricultural fields and took about an hour to reach, by which time the heat was getting hard to take. The breakfast tasted extra good after the morning walk though! Once again, the kids occupied themselves in the swimming pool, and played some soccer with William. The adults had one more complimentary massage to take advantage of that afternoon, so the day passed quickly. Unfortunately Simon began to feel unwell during the day and decided to skip our afternoon outing. But Daniel, Debbie and I dragged the resistant children out to the ghost village for a walk! The legend goes that in the 16th century an evil magician lived above the village in a small temple. He feel in love with the queen, and when she did not return his feelings he cast a spell upon the town and rocks rained down on the people who ran away all in one night. Well, in 2009 it still looks vaguely like everyone left quite suddenly, even more so now that the national Archaological Society is working to restore the main street of the town. It was an interesting place to visit, and once again we left having collected several bags full of litter. Upon returning to the resort, Simon felt well enough to come to dinner, so we were hopeful that it was just a brief bug. Once again, I had the fish thali for the third night in a row  delicious! The kids had requested a swim in the darkness, and we saw no harm in agreeing since there didn't seem to be any rules about using the pool, and the water was well lit. However, after about 5 minutes the massage therapist came out and asked them to finish up because we were disturbing a guest who was having a treatment! Oh well. Debbie and I had decided to splurge with some champagne at dinner, so after getting the kids dried off and settled into bed we managed to sit outside and enjoy the porch sofa while finishing it off. Sunday morning was Easter and Debbie had cleverly brought along some Easter eggs (although not chocolate) so that the kids could have a traditional egg hunt! Fortunately we didn't have an early departure, and they had plenty of time. After breakfast they predictably headed off to the pool for one last swim. A bus was waiting for us at 12noon to drive us to the Oberoi Rajvillas, just outside of Jaipur. The 3-hour drive passed quickly, once again driving through many villages and along lots of very nice roads  perhaps the roads were evidence that we were travelling through an area well-visited by tourists. Our welcome at Rajvillas was up to the usual standards (cold towel and drink, etc!)  after receiving a friendly tour of the grounds and being shown to our room, we dropped into the restaurant for a late lunch, followed by a swim. The pool contained 2 elephant statues at one end, which served as fountains which spray water from their trunks. The kids invented a new game involving the rubber Easter eggs from the morning hunt, giving the frisbee a temporary rest. I managed a visit to a very nicely equipped gymnasium, before gathering up the kids for baths and dinner. Our table was set up outside, but Simon continued to feel rough so he skipped the meal. With another early morning on the schedule (in an attempt to beat the heat of the daytime), everyone headed off to bed relatively early. Monday morning we were a little slower than planned, but fortunately Simon felt well enough to join us for a visit to the Amber Fort. We reached it after a 45-minute drive, after which we stopped along the road in front for the best view  and on the pavement just in front of us was a snake charmer and a baby elephant! I was particularly excited about the snake charmer, as I'd been telling the kids about them the previous day. After that we were dropped off at the gate, where visitors line up to board the transportation up to the entrance  the back of an elephant! After a 20-minute ride up the hill, which was very hot in spite of being only 9am, we reached the entrance and proceeded to walk around the fort with our guide, a Mr. Dilip Singh. He told us the story of the Maharaja of Jaipur, who used to live here, and we enjoyed the description of how he had 12 queens in order to maintain his relationship with all the surrounding kingdoms. The 12 wives' quarters were all located surrounding the same courtyard, but they were not allowed to talk to each other without prior permission, and then their conversation had to take place in a prearranged place, located in the middle of the courtyard! The Maharaja also had a secret passage way that allowed him to visit whichever wife he chose but without the others knowing. Everyone was impressed with the magnitude of the fort  it was absolutely huge! After the fort, we headed into the city and drove past the Palace of the Winds for some photos. From there we proceeded to the observatory, where scientists had built a giant sun dial as well as devising instruments to determine the date, precise time and star sign, all of which were very important astrology tools for learning about a newborn baby. Astrology is also important for determining whether 2 people were compatible for marriage and which date would be most fortuitous for the marriage. The instruments are all on a large scale and have been very carefully thought out  if we weren't so hot, we may have enjoyed spending more time there. The city palace of the Maharaja of Jaipur was across the road, but the kids had enough and were ready to go back to the hotel to cool off. In the meantime, the parents were interested in some shopping! First stop was the Art and Silver Emporium, where we first looked at Jewellery. Miranda has been asking for necklaces to wear with her dresses, and her birthday is coming up so I bought her a couple of things. Meanwhile, Daniel had wandered upstairs and found an old wall hanging he liked, as well as a couple of restored window frames with scenes painted on them. The owner also showed us his collection of antique wall-hangings, which was very extensive and interesting  that could be an expensive hobby! From there we asked to see some textiles, so Dilip took us to another place where we could see block printing onto fabric. Although the kids would not have enjoyed the shopping, they would have really enjoyed seeing how the block printing was done! We watched in fascination as a gentleman demonstrated on a small piece of cotton  it's too hard for me to explain, but the process required at least 4 different wood blocks forming different portions of the same image, each one being dipped in a different color of ink, and needing to be perfectly lined up. And to think that they can do meters and meters of fabric, both cotton and silk, using this precise method  very impressive. Next on the agenda was to watch they steps involved in making a carpet. Suffice it to say that after seeing what those carpets go through in that process, I will never be concerned about waking on one in a shop again! In the showroom, the owner dragged out example after example of carpets in silk, wool and a combination thereof. Simon and Debbie eventually made a purchase, but surprisingly Daniel restrained himself. We then headed downstairs to the fabric section, where I also found a beautiful scarf for Miranda. After that successful shop we returned to the hotel to find the children calm and relaxed, ready for a swim. Dinner that evening was served outside again  we arrived just as they were lighting these incredibly tall torches resembling the Olympic torch! We were also treated to some live traditional music, which is very hypnotic. Two nights in Jaipur was not nearly enough, but unfortunately we had to catch a morning flight to Udaipur so everyone got settled in their rooms early, having chosen the breakfast they wanted to be delivered to the room in the morning. Another smooth check-in at a domestic airport in India, and we landed in another brand new airport. Udaipur is ultramodern, and the taxi driver proudly told me that it is meant to be a replica of the airport in Dubai. In spite of our recent visit to Dubai, the building had not looked familiar to me, but I gave him the satisfaction of nodding in approval. The drive to Devi Garh, the old palace which was renovated into a luxury resort over a period of many years, took about 45 minutes, and the kids groaned about the fact that we'd chosen a hotel so far outside of the city. We pulled up to the fort in scorching heat, and everyone dragged their feet while walking up the steps. But a nice welcome drink perked us up and then we were shown to our amazing rooms. Once the heat dissipated a bit we headed down to the pool, which was huge! That evening we had another early dinner and planned to head out in the morning. Driving off in 2 cars, we reached the city at about 10am and entered the palace. What an interesting place to walk around! Although we had no guide, we enjoyed looking at all the paintings which depicted life in the 17th century. Fortunately the sky was a bit overcast so the temperature never got as high as we'd anticipated. Since the weather was so pleasant, we asked our drivers to take us to a shop for some stones. Auntie Debbie had given the kids each 700 rupees to spend and we ended up with some blue onyx, green onyx, amethyst and lapis. After that successful shopping outing we returned to the resort for another afternoon in the swimming pool. For Simon and Debbie's last evening in India, we had arranged to dine on one of the many terraces scattered about the fort. So we arrived just as darkness was setting in and took in the views of the surrounding village, which really comes alive at night. Dining outside, beneath the stars, was a very special experience, including champagne! Our final day with Simon, Debbie and the boys was lovely but also sad. The kids had such a great time together, and we knew they would find it difficult to say "good-bye". After a leisurely breakfast we packed up and headed off to Udaipur airport. Simon and Debbie kindly offered to carry a few items back to London for us, to help lighten our load. We will look forward to seeing those items on our next visit to the flat in London! Our flight was on time and relatively uneventful, though Jet Airways were a bit tense about getting us through security and onto the flight  with about 45 minutes to spare! The experience was unnecessarily stressful, given that other passengers were boarding about a half an hour after we were ... But some things are rather inexplicable, as we have discovered. We arrived in Delhi with plenty of time for the kids to hit the swimming pool together, while I repacked the suitcases and found more items to send to London. Then we all headed down to the Chinese restaurant and enjoyed a delicious meal together before seeing them off in the lobby of the Taj Hotel, with promises of meeting up again soon. I'm really pleased that the cousins will always have their shared memories of this time together  hopefully something they will all discuss many times in years to come. Click on any picture below to launch a gallery of pics from Rajasthan. 28-Apr-09 :: By the time we reached Aman-i-Khas it was just after dark and we were greeted with more wet towels (love that!) and a blazing camp fire! After meeting the managers, a married South African couple known as "G" and "D", we were shown to our "tents" (more like a huge, luxurious marble room covered with canvas) and given a chance to prepare for dinner. Since everyone was hungry that was no problem. Our "batmen" (another name for personal butler, I guess) were ready to serve us dinner and we split into 2 tables  adults and kids. Dinner was very enjoyable, but none of us wasted any time eating and getting to bed because we knew that the 6:30am wake-up call would arrive quickly! Getting everyone up and ready for the early morning safari was a little painful, but once we settled into our extra large jeep we could relax a bit. The guide didn't speak English very well, which was a disappointment after our fantastic experience at Pench National Park. But we maintained a positive attitude, hoping to see our first tiger! The guide informed us that we would be driving around Zone 1  as we discovered, this is a rather dry section of the park, with lots of sharp and leafless twigs hanging along the side of the road at this time of year. More than one of us got a nasty scratch across the face during the drive. We were also rather confused by the strategy  the driver seemed to race toward the end the of Zone, turn around and return to the entrance, with barely a stop to listen for distress calls or any of the usual signs of a predator in the area. In fact, we hardly saw any wildlife at all, so our first safari in Ranthambore was rather disappointing. Still, we managed to enjoy the day. The massage therapist from the resort stopped by our breakfast table to find out what time we would like to schedule our complimentary massage  so Debbie and I decided to visit the spa at 2:30 that afternoon. Once we adults finished our relaxing breakfast, we found the children cooling off in the tents and gathered them together for a swim. The pool was in a lovely location, with plenty of shade around it, and with ample space to continue the frisbee game! By the time 2:30pm came around, the children had all returned to their tents to have some down time and Debbie and I headed off for our massages. It was my first time sharing a room with another person, but we didn't disturb each other. Afterwards, we both agreed that the time passed so quickly we must have dozed off at some point! Following our disappointing safari in the morning, we opted for a different afternoon activity. Around 4:30, we piled into two Gypsys (open-topped jeeps!) and headed off to a lake which is located just outside the park. The drive was very interesting because we had to pass right through the center of a couple of villages, which were full of tidy little gardens and energetic children, not to mention goats and cows! We felt like part of some celebrity parade or something, as children ran from all directions just to wave to us, hoping for a greeting. After passing through the villages, the road wandered through a dried up river bed and along some very cryptically marked paths. But we were treated to sightings of quite a few animals  dozens of blue bull, which we had seen a few of in Pench; quite a few chinkara, which is a small Indian gazelle; sambar, the large deer which is a tiger's favorite meal; and plenty of spotted deer as well. And once we reached the lake, there was a blanket with picnic snacks laid out for us and a glass of wine for the adults! The lake also contained some crocodiles, which we hadn't yet seen in India, so we were excited to spot a couple. Ben also managed to add a couple of new birds to his list, and we enjoyed the cooler temperature brought by the setting sun. The sunset also seemed to bring in some rather dark clouds and, to everyone's surprise, lightening! Rain is uncommon outside of the monsoon season (which typically begins in June) so thunderclouds are not a common sight. At first we were certain they wouldn't produce anything so we hung around and slowly packed up, taking our time and enjoying the scenery. But after a bit the clouds seemed to have taken over the sky and we remembered that we had driven out there in open-topped vehicles so we picked up the pace. As our driver was following the path along the dried up river bed in the dusk, the rain started to come down. Fortunately it was gentle at first and everyone was laughing about getting a little wet. As we approached the village, the rain started to come down a bit harder, but the children still managed to come to the roadside and greet us! Once we passed the village and hit the paved road, the Gypsys were able to speed up a bit, as it was getting dark, and at that stage the rain was really bucketing down, but we were all screaming with delight at our adventure. By the time we reached the resort, everyone was soaked and exhausted, so after a quick bath we headed up to the lodge for dinner. Up at the fire pit by the main lodge, the daily live musicians were joined by a fire dancer! The kids were all perched on the wall along the steps, watching in fascination as he danced around, apparently breathing fire. After the entertainment ended, dinner was served at tables outdoors. Another fantastic meal, and then off to bed in anticipation of an early morning. Rising at dawn is a bit easier when the wake-up visit is accompanied by a pot of fresh tea and a plate of biscuits! Once again, we boarded our vehicle at about 6:30am and headed for the park entrance. On this occasion we were assigned to Zone 3, which is entered just below the Ranthambore Fort. All of us were surprised by how busy the park gate area was  more like a bustling little village, but in a rather odd location. After going through the gate, we immediately passed a beautiful lake  already we were enjoying Zone 3 much more than Zone 1! As we drove along, we came to another large lake, filled with water birds and crocodiles! The abundance of water in the area made the morning so much more pleasant, providing lots of wildlife to observe and photograph. Suddenly we came upon a group of jeeps all lined up on a particular stretch of road, and discovered that they were watching a tiger! Although it took me awhile to see it lying down on a log, somewhat hidden by tall grass and twigs, everyone else was able to see it quite easily. After a few minutes it slowly got up and walked off into the dense bush, where we were unable to follow it. Still, everyone was excited by the fact that we'd finally seen a real tiger, and he was quite a large male as well. Shortly after that we were caught in a cloud burst and took shelter beneath a tree, which was largely ineffective at keeping us dry. On the positive side, the rain stopped the temperature from rising too quickly and we actually ended up feeling a bit chilly. When we finally drove on, we came across another procession of jeeps driving very slowly  it turns out they were following a female tiger walking along the road! She had a large black radio collar around her neck, which meant that the photos look a bit odd, but we were still ecstatic to have seen a second tiger in one outing. She walked very close to our vehicle at one point and we were able to see her true size  a breathtaking sight. After a successful morning drive, we returned to the lodge for breakfast, and had a nice chat with Gerhard, the manager, about conservation and the future of the tigers of India. We then passed the afternoon with swimming and reading, while Daniel and Simon had their turn at a massage. In the late afternoon, a camel arrived pulling a cart for everyone to have a ride. The camel was able to carry 2 people at a time on its back, while everyone else sat in the cart. I gather that everyone had a turn on the back of the camel and the consensus was that it provided the most uncomfortable ride known to man. Daniel and I were relieved that we had not scheduled a proper camel safari in the desert during our stay in Rajasthan! Since Benjamin and I are allergic to animals, we used that as an excuse to skip the camel ride and arrange for a separate nature walk for the two of us. To our surprise, the nature "walk" involved driving for an hour to another lake, a short walk, and then driving back. Although a long drive was not what we had in mind, we enjoyed our time with Ashlish, our guide, who happens to be a bird expert. Ben managed to add several new species to his bird list, and we also saw a monitor lizard on our short walk. Back at the lodge, we enjoyed our final dinner at Aman-i-Khas, and prepared to leave the following day, shortly after our safari. Thursday morning we were pleased to see that Ashlish was our guide to enter the park, and we learned that we'd been assigned Zone 4. Although it was not quite as picturesque as Zone 3 (amazing how the landscape can vary so much in a relatively small area! ), we found lots of birds and we narrowly missed seeing a tiger  we waited at a particular point on the road, listening to the prey call out in distress, but no tiger came and we learned later that another jeep came after us and saw the tiger cross the road in the same spot. But we were all satisfied with our 2 tigers from the previous day and didn't mind. After returning to the lodge and enjoying another large breakfast, we packed up and prepared to leave, managing a quick swim first. Gerhard had promised to tell us all about his amazing recent experience taking an orphaned leopard cub and re-introducing her to the wild, so we managed to watch his slideshow and learn a bit about leopards before continuing our journey. Leaving Ranthambore was quite sad, as the kids managed to feel quite at home there in just 3 days. For the drive to Amanbagh, the resort had arranged 4 Scorpio SUVs to take us on the 3-hour journey. The drive took us on a variety of roads  some dirt paths through villages, and even a dual carriageway! The toilet stop was predictably grim, at a service station. And the snacks that had been packed for us didn't get much attention, so we arrived at our new hotel with a good appetite! Click on any picture below to launch a gallery of pics from Ranthanbhore.